Enjoyed our last meet up of the year at the East Bay Depot for Creative Reuse. Big thanks to the Depot’s and Education Coordinator, Natasha Stillman for making this possible! Participants: James Treacy, Skyline; Amber Miller, Chabot; Deborah Gordon, OUSD; Kristin Vetterlein, Grass Valley; Michelle Lewis, Glenview; Aracely Sifuentes-Ordaz, Melrose Leadership Academy; Ann Wettrich, OUSD/VAPA; Natasha Stillman, East Bay Depot for Creative Reuse. Natasha provided an overview of the Depot—created by and for teachers–its mission, goals and resources. She talked about the Depot’s dedication to being part of the environmental solution—through education programming and through salvaging and redistributing materials that can be reused and reducing the amount of garbage in landfills. We learned that on average, each of us creates 7 lbs of garbage a day and that the Depot diverts over 200 tons of reusable materials from landfills each year. Currency – studying different types, forms and designs of money over time and places. Ideas suggested: redesigning a currently, making your own currency, examining how money changes from colonial to post colonial times, looking at artist Ray Beldner’s art work with money. Garbage Selfies – Collect and photograph self with waste from one day or one lunch period—sorting, analyzing and talking about alternative ways to use and reduce the amount of waste we create. Material Finds—Great finds—pencil leads and supplies for art making. Sculpture Assemblage Exercise: Ann asked everyone to make an assemblage type sculpture in response to the question: What does learning look like? 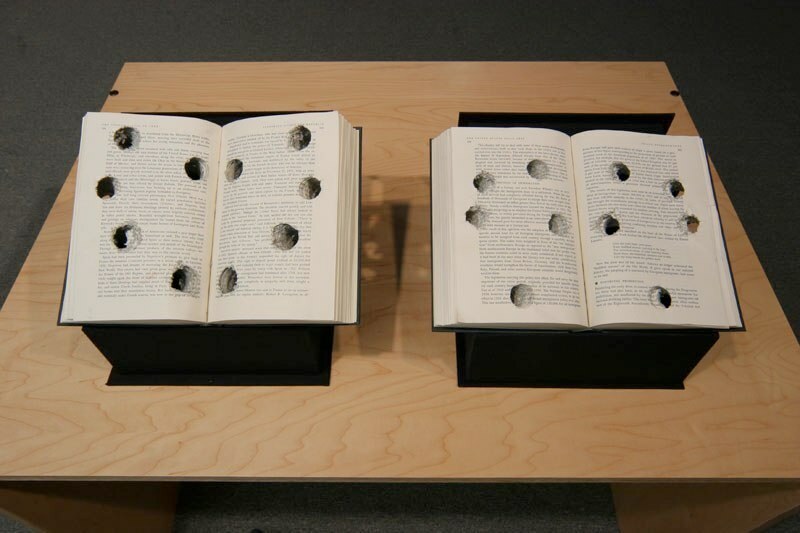 [or make up another question…the idea was to be guided in the process of making by inquiry]. This was followed up by a debrief–talking about our creations and creative process–whether led by questions or materials, along with observations about learning. Integrated Learning Specialist Program – June intensive classes, register now before classes fill. Thanks! for participating in the VATN this year, contributing to a enlightening, lively collegial learning exchange and community of support. 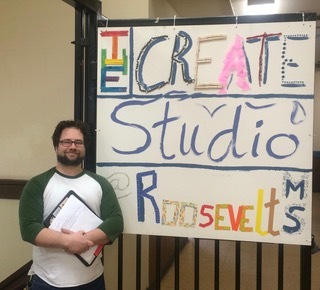 April 12, 2017 – Session at Roosevelt Middle School, Create Studio with presenters Brooke Toczlowski and Carl Barone. Participants: Blanka Soltys/Fremont; Aracely Sifuentes/Melrose Leadership Academy; Claudia Goodman-Hough/Redwood Heights, Lisa Hoffman/Redwood Heights,Jamie Treacy/Skyline; JohnChristie/Castlemont; Deborah Gordon/Castlemont, Nestor Gonzalez/Dewey; Leah Jensen/McClymonds), Julia / Maker Education, Michelle Lewis/Glenview, John Christie/Castlemont; Amber Miller/Chabot, Kristen Vetterlein/Grass Valley, Carl Barone/Roosevelt-presenter, Brooke Toczylowski/Oakland International High-presenter, Ann Wettrich/OUSD VAPA team facilitator. 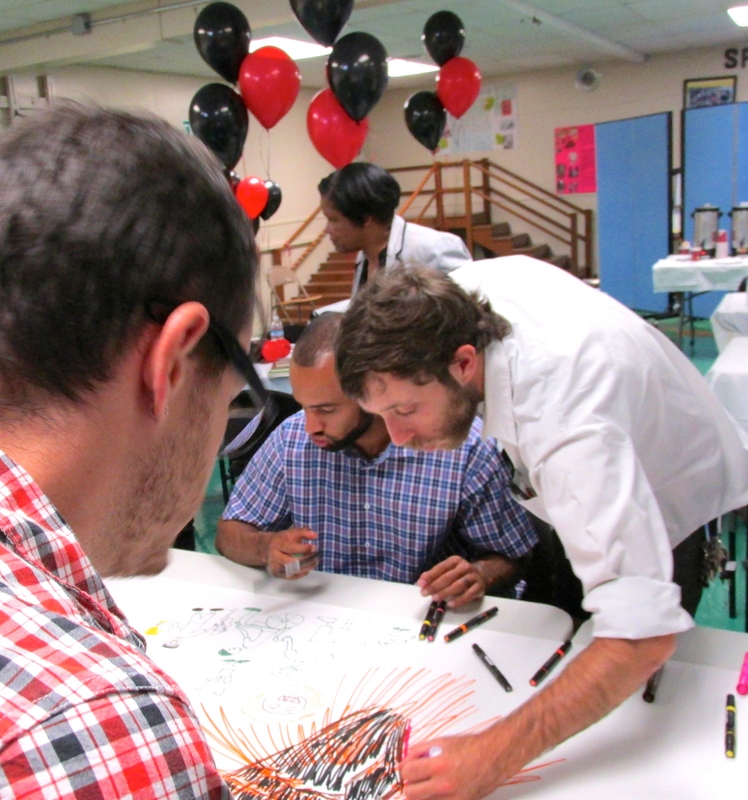 What is the relationship between art and maker education? Brooke and Carl Barone teamed up to present a dynamic professional development session in Roosevelt’s Create Maker Studio. 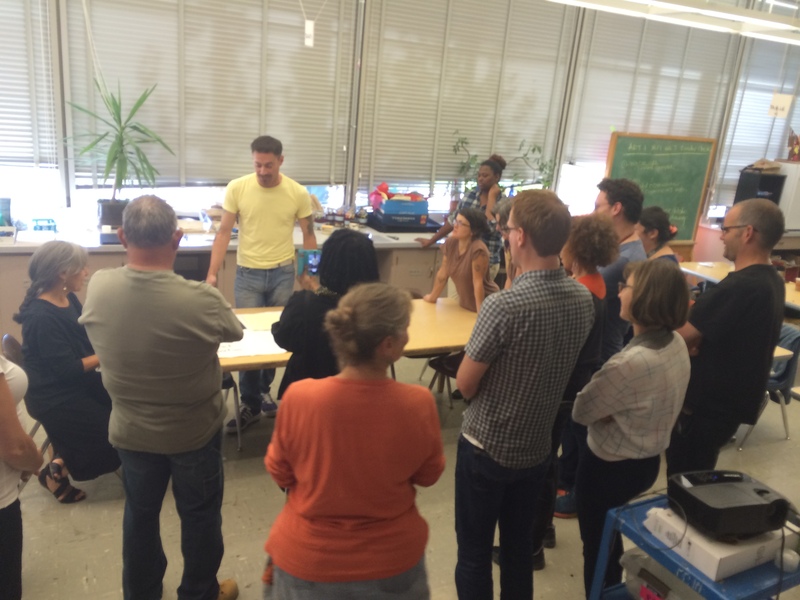 Part I – We began thinking about the similarities and contrasts between art and maker education. Working in small groups we charted ideas and shared out for whole group discussion. A few highlights: We realized that it’s all about intentionality and how we focus what we teach. Art history, aesthetics and meaningful personal expression are relevant to the arts and perhaps not to maker education where engineering and problem solving are prioritized. Making is critical to both and propels the thinking, innovation, discovery and learning. Part II – Brooke gave out two useful documents to help us consider teaching, learning and assessment strategies across the realms of art and maker education: ) Studio Habits of Mind—outlining the eight habits that arts education cultivates—stretch and explore, express, develop craft, envision, understand arts community, observe, engage and persist and reflect; and Agency by Design guide emphasizing the maker skills of Looking Closely, Exploring Complexity and Finding Opportunity. We took time to review and discuss. 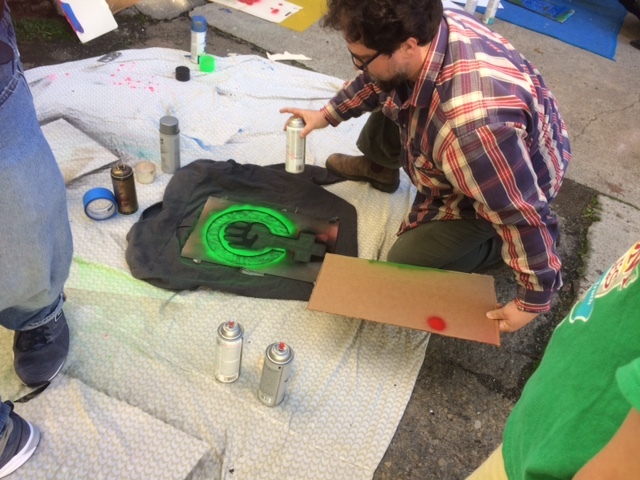 Part III – Carl talked about his work at Roosevelt and his ongoing work in developing a maker space and studio. He emphasized how successes and failures have helped him to iterate and revise his curriculum, projects and teaching. He is grappling with ADA issues in his basement space with a broken elevator and a lack of tools and materials. A cooking project failed because there were too many moving parts, while a woodworking project flourished with the revival of the school’s former wood shop. He has also been successful with collage and paper mache projects. Giving students choice and cultivating agency are among his top priorities and goals. Part IV – Carl and Brooke engaged us in a Parts, Purposes and Complexities hands-on exercise involving the construction of a paper circuit. We began by observing and discussing in small groups. Then we were given materials to work with and tasked to make one of our own paper circuits—with the additional challenge of integrating it into am artwork that represents something about ourselves. Part V – We did a gallery walk and debrief—sharing our work, process, learning and discoveries—thinking again about different disciplinary strategies that we utilized. 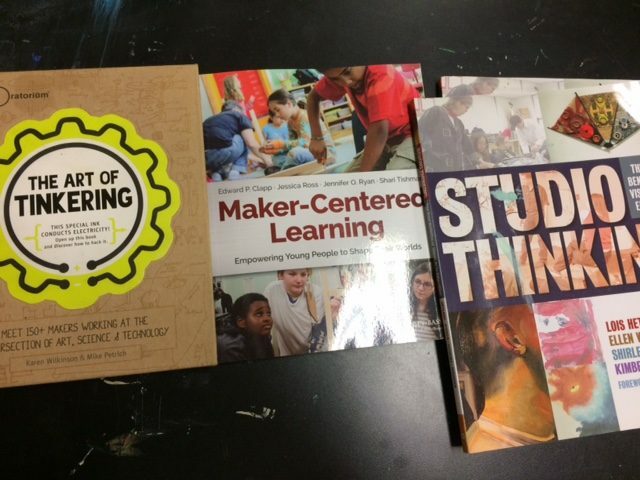 Check the Calendar for more maker PD opportunities and the Resource page for Maker resources. Participants: James Treacy, Karen Gorman (student teacher from CSU East Bay), Ana Ponce, Skyline; Donna Salonga, Skyline; Lauren Litwin, Skyline, Ann Wettrich, OUSD VAPA facilitator. 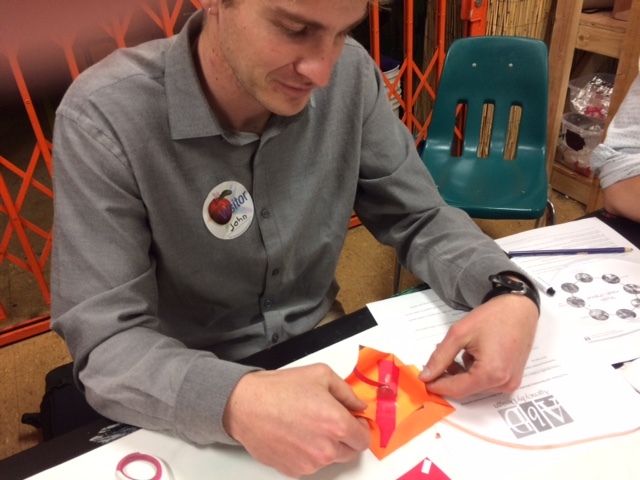 Serving as host and presenter for this STEAM workshop “Creating a Line of Inquiry,” Jamie introduced the workshop–exploring art/science connections and thinking about how to support student research, sustained inquiries, and development of a body of work. He began by talking about his interests in learning more about how artists give themselves assignments and set parameters to inspire the development and evol ution of their work. He discussed teaching struggles–how to help students identify their own curiosities and begin formulating generative, open-ended questions to fuel their work? To engage us in this topic, he asked us to jot down and share our own interests and questions in the art/science realms. We identified a handful of things, including: how the brain interprets new languages, layered memories, inspirations of science fiction, anatomy, botany, and harvest as metaphor for intersections of nature and culture. After a brief discussion, Jamie delivered a power point presentation. He outlined key ideas, providing us with the opportunity to review and discuss the works of artists who were inspired by scientific ideas, imagery and methods–Swedish artist, Hilma af Klint, born in 1862 and contemporary artist Wolfgang Ganter. Before concluding, we had a little time to discuss and explore the resource links Jamie provided and dive into our own research questions, making connections and thinking about how we might apply the ideas presented. Lastly, we took a look at one student’s sustained investigation work (featured above). We hope to keep this conversation going, participants are invited to share their ideas/imagery on the website blog page or with Jamie directly. NEXT MEETING: Mark your calendars– Wed, April 12th, 2-4. Place and theme to be announced. Visual Arts Supplies – Phil reported that the he is working though the OUSDchannels and should be able to follow up soon, in providing all teachers who applied for $800 in supply funding with confirmation, PO numbers and information on how to order. 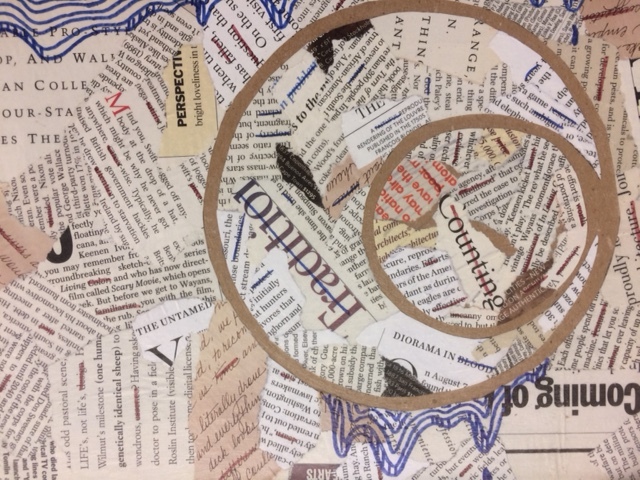 Online Resource Review – Ann did a quick review of our wordpress website and highlighted two arts resource links that we talked about in January—the Spiral Art Education website’s “cool curriculum” and PBS’s Art Assignment. We also looked and discussed thinking routines and other methods for engaging students in deeper observation and discussion of artworks in museums. Museum Exploration – We decided to try out the “See/Think/Wonder” routine and the gallery-of-california-art-omca for 3-5 grade educators to heighten our observations and think together about how we might use and adapt some of these strategies in the classroom and/or museum settings with students. A small group, we enjoyed spending time learning from each other and the artworks, as we took time to look and think together. 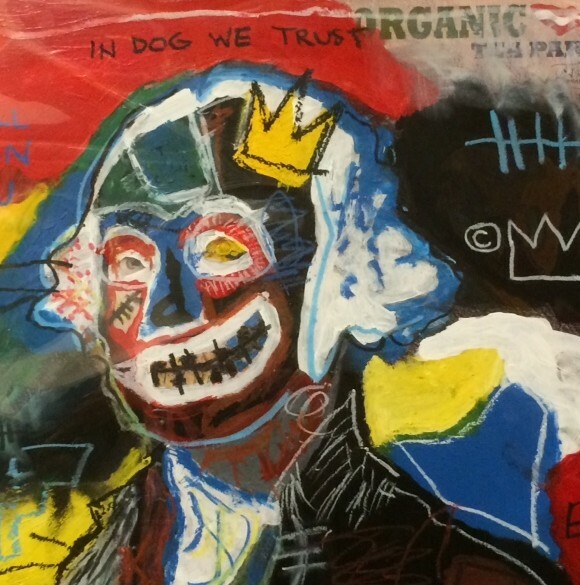 Themes that emerged included technique, identity, empowerment, contemporary art, different styles, media, time periods, cultures, and disciplinary perspectives in the portrait and landscape galleries. January 27, 2017 Visual & Peforming Arts PD “Buy Back” Day at International Community School. Participants: Visual Art Teaches – Jamie Treacy/Skyline, Deborah Green/Oakland Tech, Carissa Moline/New Highland, Michele Lee/Encompass, Aracely Sifuentes-Ordaz /Melrose Leadership Academy; OUSD VAPA team – Ann Wettrich. We enjoyed gathering with music teachers in the morning for a workshop on Trauma Informed Schools and Positive Behavioral Interventions & Supports (PBIS) and then having our own visual arts teacher breakout group in the afternoon. Workshop presenters included Phil Rydeen, who did an engaging visual arts/writing exercise that included partnered and whole group conversation–a good warm up and lead-in to PBIS specialist, Kathy Bennet’s workshop. Kathy guided us through purposes, strategies and best practices of PBIS and facilitated conversations and questions. We discussed brain research and how it has led to new understandings about the impact of trauma. Fortunately, neuroplasticity tells us that brains are responsive to positive interventions that can mitigate damaging effects—underlining the valuable role teachers can play in shifting outcomes for students by creating supportive schools and classrooms. As strategies, we discussed the value of self-reflection and the concept and cultural humility, unlearning privilege and surfacing cultural blind spots while understanding historical trauma, power imbalances and institutional accountability. To explore these topics further, check out: Nadine Burke Harris’s TED Talk How Childhood Experiences Affect Health Across a Lifetime. You can take the ACE (Adverse Childhood Experiences) test, where high scores correlate with significant biological repercussions via the stress response system. You can also learn more about PBIS strategies applicable to your teaching, here. Check out on the RESOURCES page of our website—downloadable PBIS resource handouts from the workshop. Social Justice – We thought together about how to deepen and build on curriculum in this area and explored useful on-line resources. This generative discussion meandered and challenges discussed included: integrating themes to deepen still life drawing exercises, defining terms such as race and how does whiteness play into erasure of culture, power dynamics and accountability, ESL vs. dual language immersion. 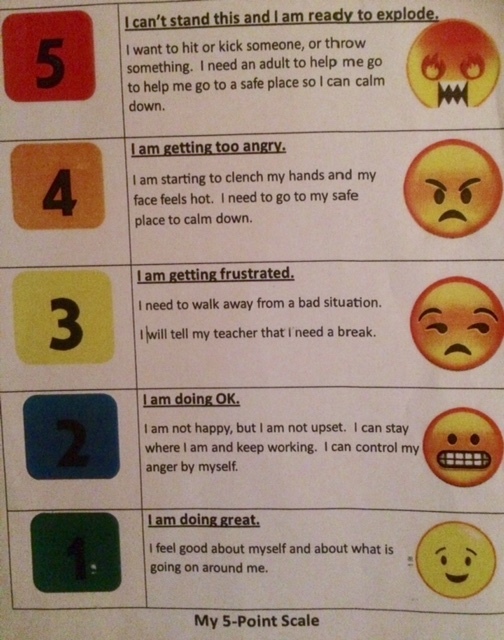 Strategies included cultivating a growth mindset and mindfulness exercises. Curricular Examples – Social Justice themed highlights: Deborah’s Climate-Change School Poster Project, Michele’s 4-5 grade Flag Project, making ancestor heritage flags and then working in diverse partner groups to create new flags for America; 1-2nd grade Guided Drawing – making a book of animals in Spanish/English; Carissa’s “Wall Project” working with New Highland’s post-election theme of student empowerment, inspired by works of contemporary artists. 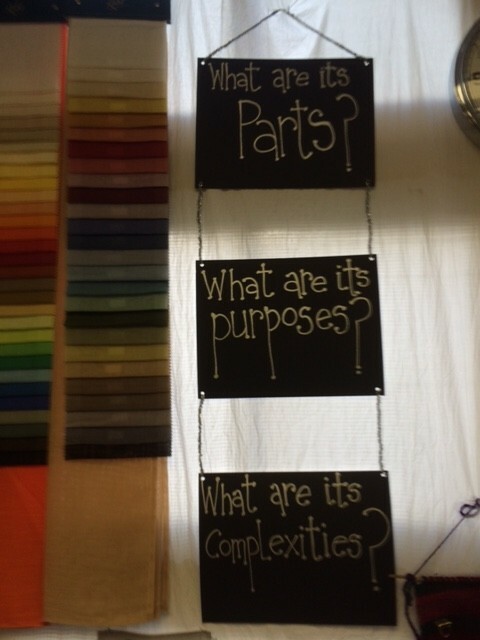 Every class will made a wall connected to overarching theme, i.e. First grade—Wall of Us, Third grade—Wall of Wonderful. At the end of the year, it is hoped that all walls will be joined together across the school. 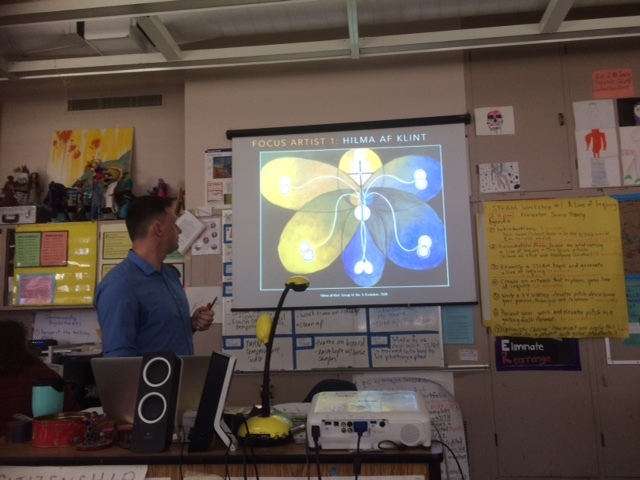 Designing AP Studio Course – Jamie presented his challenges of helping students create sustained investigations with both breadth and depth to build successful portfolios that rank highly on the college board APR reviews. Successful portfolio samples examined include connecting student autobiography to a theme of investigation. Examples highlighted portfolios of students with exotic and/or outstanding life experiences. Jamie’s students are finding it difficult to come up with relevant competitive themes. We brainstormed how a student who is interested in popular culture beach photos could deepen her investigation to include things like—sea level rise/environmental issues; refugee crossing, etc. 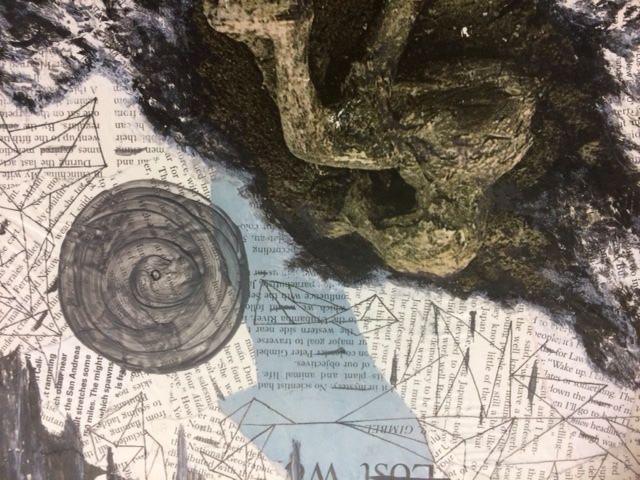 We suggested mind-mapping as a strategy to help students widen their ideas, as well as researching artists whose work included this theme. If a student is more interested in the principles of art and design—a theme like color investigation could emerge. They could research how artists working at different times and across different genres considered color, look into the physics of color, and/or explore diverse cross-cultural color perspectives. Resources recommendations: Carol Dwek/Growth Mindset TED talk; Class Dojo – simple ways to build happier classrooms, the Beautiful Oops – to foster creativity; Spiral Art Education “Cool Curriculum” for secondary school engaging social justice approaches; Art Assignment PBS series / exploring history through the lens of the present with contemporary artists offering up engaging assignments. 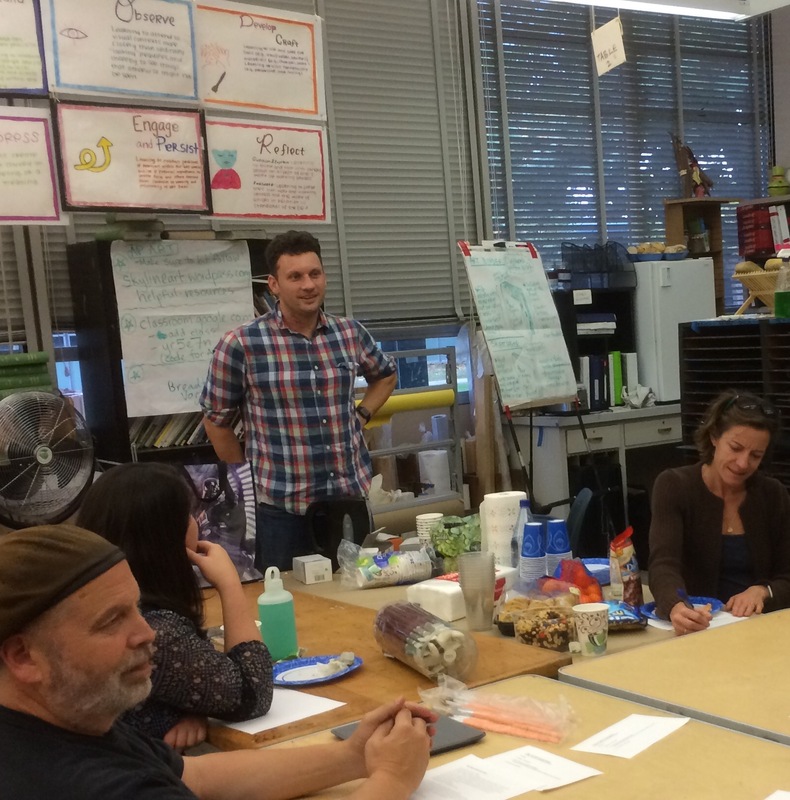 2) Visual Arts Teacher Network – updates and meeting planning. Visual Arts monthly PDs from Feb – May. We decided to hold the sessions on the 2nd Wednesday of each month from 2-4. Teachers attending must ask their principal for permission to attend the visual arts teacher PD in lieu of the school PD scheduled on this day. We understand that not everyone will be able to attend. We are making this change because the 4-5:30 Tuesday sessions offered last semester, we’re too late in the day for most. Upcoming meetings will be from 2-4 on the following Tuesdays: February 8, March 8, April 12, May 10. At each meeting we strive to have a theme with a presenter (please volunteer), an interactive exercise that can be applied to teaching, and an opportunity for teacher exchange. We’ll also be looking into occasional meetings at art venues. See CALENDAR on this website for schedule and updates on content and location. Visual Art Supply Orders. Ann reminded everyone to complete the form Phil sent out to register for supply ordering—due Jan 30th. Once you are registered, Phil will send you information on how to order your supplies. If there is a visual arts teacher you know that is not the list, please let us know. January 14, 2017 at Tiny Splendor studios / P.O.P. 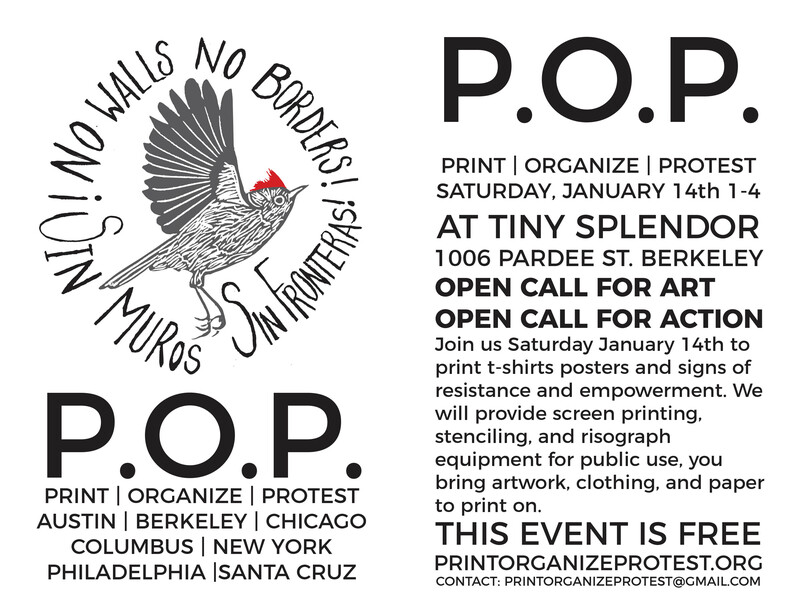 print/organize/protest workshop. Participants Teachers – Michelle Lewis/Glenview; Nestor Gonzalez/Dewey; and Carl Barone/Roosevelt; Ann Wettrich/OUSD Visual & Performing Arts team; Brooke Toczylowki / OUSD Agency by Design Project (one of organizers for this workshop). upcoming rallies. 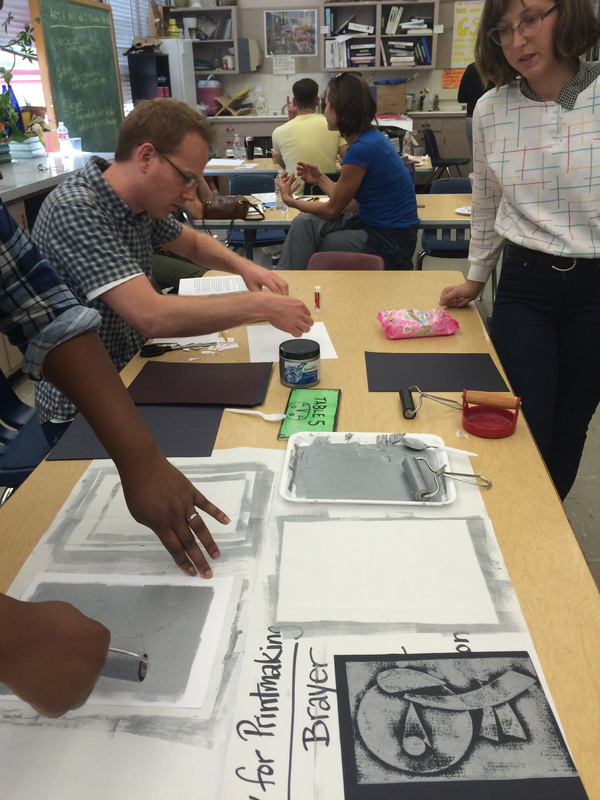 Printmaking strategies employed including stenciling, rizograph, screen printing and linoleum block. November 15, 2016 at FLAX in downtown Oakland. Participants Teachers – Blanka Soltys/Fremont; Debora Gordon/Castlemont; Deborah Green/Oakland Tech; Nestor Gonzalez/Dewey; Michelle Lewis/Glenview; Carl Barone/Roosevelt; Amber Miller/Chabot; OUSD/Visual & Performing Arts – Phil Rydeen & Ann Wettrich. Howard Flax was introduced and welcomed the group to FLAX. We thanked him for his hospitality in offering us with meeting space–setting up work tables/chairs and providing us with journal workshop supplies and gift bags. We learned that FLAX provides a 10% discount for teachers and also offers some free arts weekend workshops for customers. Check out FLAX website for details. Beginning Discussion of the questions: What is a journal? and Why do we journal? Conversation highlights included: getting down with my brain visually; creative writing; to activate and focus thinking—capturing ideas in words and drawings; meditative, like coloring books for adults. Personal and Teaching Journal Practice. Nestor described his long-standing journaling practice, starting out as a teenager. Trained as an artist and scientist, he draws inspiration from both fields. He showed a few of his journals and discussed how he begins by numbering each page and often creates a table of contents. 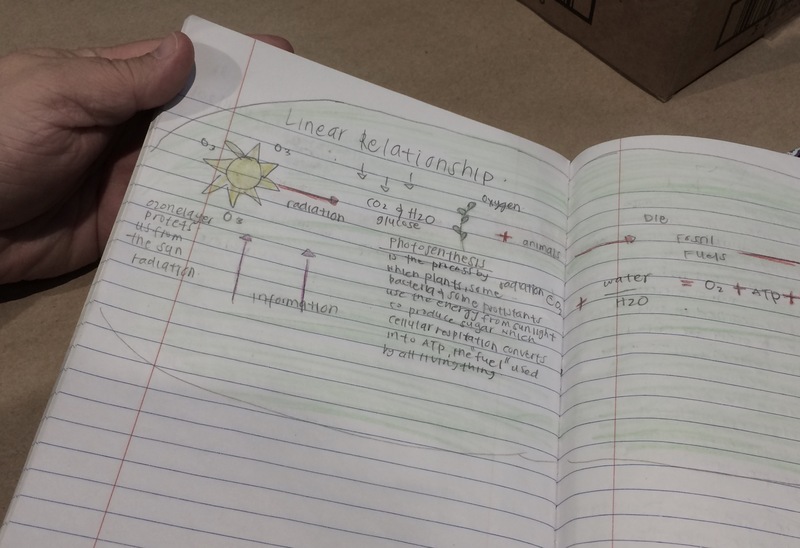 His journals include diagrams with labels, stories, poems, sketches, collages, etc. As a teacher he engages students in journaling by encouraging playfulness and integrating personal reflection with class notes. He passed around some student journals—noting the variety of styles and shapes. Nestor recommended giving students specific prompts to get them going and gave examples—i.e. making a journal for or about someone you love; making a journal using letters of the alphabet to create an image, etc. Group Journaling Exercise. Passing around a recycled student journals and setting out an array of materials to use — magazines, glue stick, scissors, markers, color pencils, etc., Nestor instructed us to 1) take a recycled journal and open to the middle; 2) use the materials at hand, and respond to the prompt: Create a representation of yourself in the journal and a wish for your students. At the end, we did a gallery walk (observation and reflection) to look at each person’s work, noticing different styles and strategies. Finally, we stopped in front of one of the journals and each described what we found compelling or appreciated in that particular journal. Meeting Schedule/Site Planning – Phil is continuing to advocate within the district for the return to Wed. Monthly PD and Buy-Back PD days. In the meantime, the plan is to meet once a month on Saturday mornings (for museum/gallery site visits and meet ups) and/or Tuesday afternoons from 4-5:30. Check the website calendar for upcoming meeting days and sites. Next meeting – January 2017 at KALA. Ann will work to confirm a date ASAP and will send out a notice to the group. 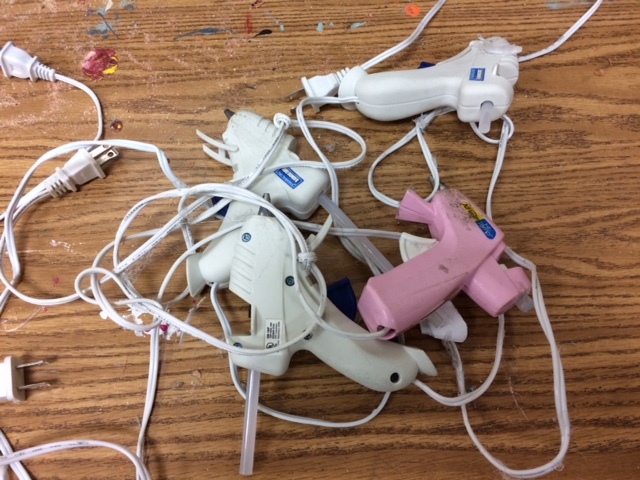 Art Supplies/Materials – The VAPA office has some money to purchase visual arts supplies. 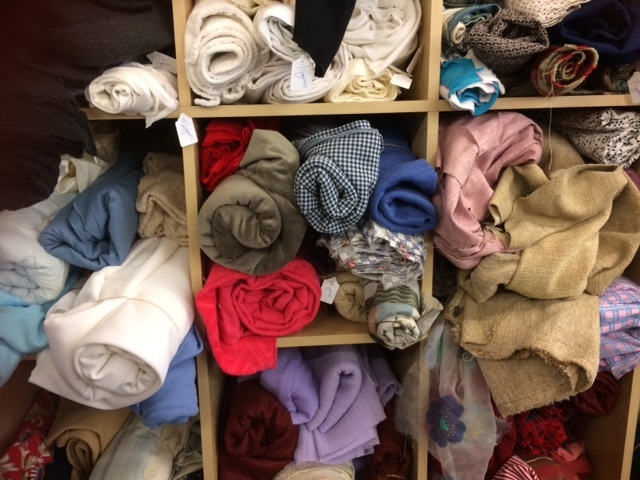 Nestor and Michelle volunteered to work with Ann to develop a list of 50 basic supply items. Once created, VAPA office will send out forms with ordering instructions. We are estimating between $500-1,000 in materials/supplies per visual arts teacher. 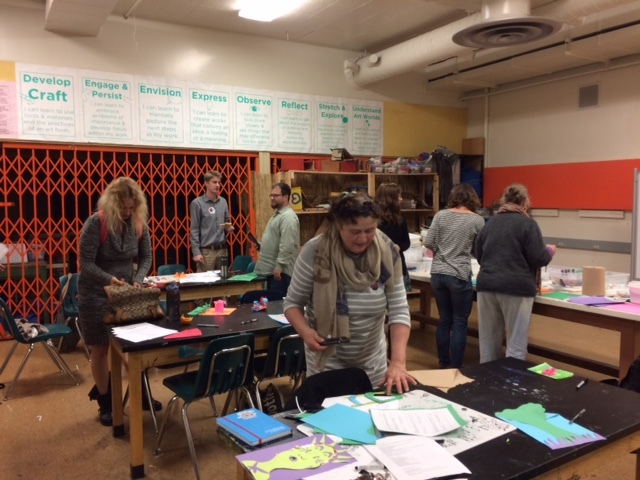 Participants: OUSD teachers – James Treacy/Skyline, Blanka Soltys/Fremont, Debora Gordon/Castlemont, Kristin Vetterlein/Grass Valley, Amber Miller/Chabot; Nestor Gonzalez/Dewey, OUSD Visual & Performing Arts Office – Phil Rydeen and Ann Wettrich. 1. Opening & Meeting Purpose Phil Rydeen thanked Jamie for hosting the meeting and everyone for coming to plan an alternative PD program for visual arts teachers this year. The district has shifted its professional development structure this year—dedicating Wednesdays for focused school site level PD sessions. 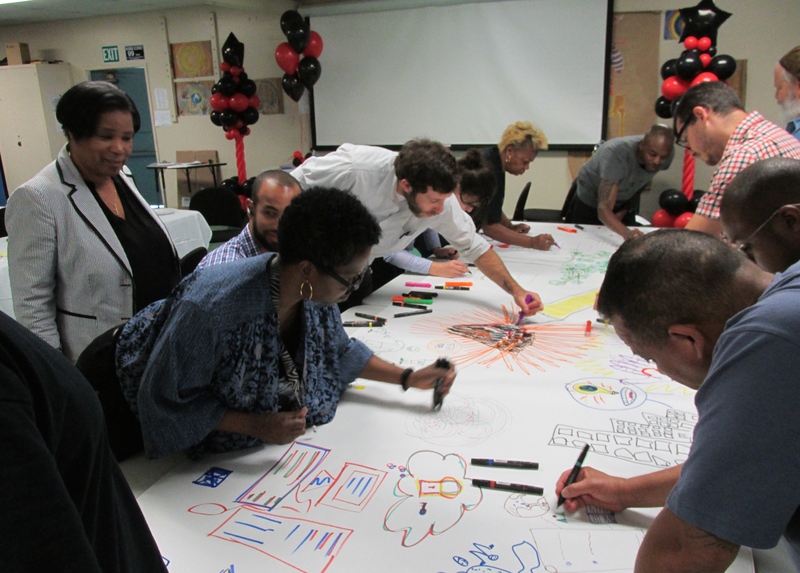 This challenged the Visual & Performing Arts Office (VAPA) to come up with a new plan for convening visual arts teachers. 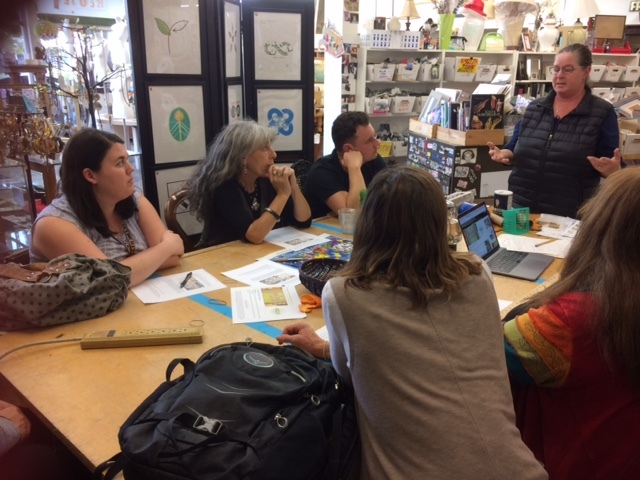 We very much want to keep the Visual Arts Teachers Network (VATN) going and build on the momentum of the past several years and have dedicated resources to pay OUSD visual arts teachers for attending monthly or bi-monthly VATN sessions. Experiential, kinesthetic approaches with take-aways that can be easily and immediately applied to teaching. Consider allocating some time at the meeting for “problem” of the month discussion and brainstorming of solutions. Recommended upcoming PD opportunities in the community – see calendar page. VATN: How can we get a list of all visual arts teachers in OUSD? Phil will contact HR to see if they can provide. After the ice cream social year-end celebration, Phil welcomed and thanked everyone for their outstanding work this year. Story Circles – Protocol and Revelations. We formed a couple of groups and engaged a story circles protocol to exchange growing edge episodes from our work this year. We sat in a circle and took turns as storytellers. Each person told a one-minute story. The group listened intently and afterwards took 30 seconds or so to mirror back memorable gestures, repeating significant words, phrases and expressions of the storyteller. It was an incredible honor and inspiration to hear everyone’s compelling, personal tale that brought to life teaching adventures across the spectrum that collectively included risk taking, innovative strategies, improvisation, generosity, surprise, revelation, enduring and passionate engagement, joy, challenge, success and on-going efforts and commitments to improve, learn and grow as music and art teachers. Planning Session. Phil updated the group on OUSD plans and emphases for 16/17 school year. PD: Adding ½ hour to PD time on Wednesdays with on curriculum and learning. Time could be used for collaborative planning, engaging common language frameworks, job alike teamwork, etc. OUSD is shifting to an “inclusion” model (either next year or the year after) where all learners will be grouped together—including those on the autism spectrum. Next we broke into planning groups by discipline and discussed challenges and ideas for our work next year. Growing the Network. 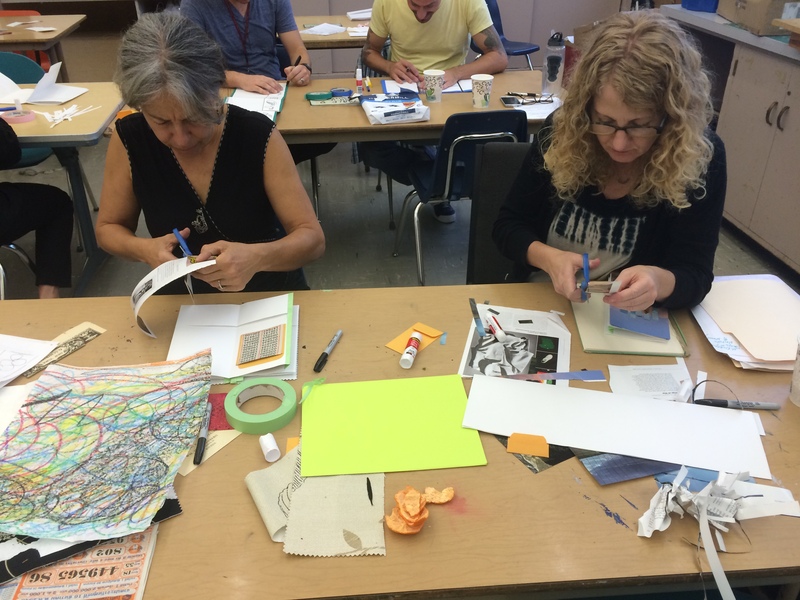 How can we get ALL visual arts teachers on the email list—especially elementary art teachers? Ideas suggested included sending an email to all principals to get contact info for their visual arts and/or prep teachers (who serve as art teachers). 21st Century Teaching Strategies – including technology integration—apps, software, cell phones, etc. Generative Topics – Engaging students through their interests, i.e. representational drawing. Connecting student interests to overarching educational goals. Integration & Collaboration – Across arts disciplines, as well as non-arts subject areas. Participants: Teachers – Kevin Ingersoll/Dewey; Deborah Green/Oakland Tech; Michelle Lewis/Glenview/James Treacy/Skyline; Kristen Vetterlein/Grass Valley; Deborah Gordon/Castlemont; Ana Ponce/Skyline; Nestor Gonzales/Bunche; Carla Oden/Skyline; Don Greene/Melrose; Ericka Duke/West Oakland Middle School; Carl Barone/Roosevelt; Julianne Sterling/ProArts; Claudia Goodman-Hough/Redwood; Facilitators: Presenter – Brooke Toczylowski/OUSD Agency by Design; Ann Wettrich/OUSD VAPA Team Consultant. Big thanks t o Michelle Lewis who hosted our session at Glenview and provided a wonderful array of snacks! Upcoming WASC meeting: How to present student work and curriculum so that it is recognized and understood? Introducing today’s workshop that puts these shifts into play, Brooke disseminated and reviewed the ABD information handout describing its aims, principles and thinking routines, including a chart that emphasizes the three core capacities: 1) Looking closely; 2) Exploring Complexity; 3) Finding Opportunity. Moving us quickly from theory to action, Brooke engaged everyone in the thinking routine: Parts, Purposes and Complexities. We broke up into small collaborative table groups with paper, tools and markers and an object (i.e. lamp, answering machine, door lock). Our task was to explore the object as a group in stages first by drawing, then deconstructing, diagramming, labeling, discussing purposes and relationships of parts, brainstorming redesign and new inventive possibilities. new ideas generated: 1) one group would be charged with taking the object apart and another group would be charged with putting the object back together or creating something entirely new from the parts; 2) thinking about different kinds of objects to take apart—i.e. old apple computers to understand the underpinnings of technology—its electrical and mechanical parts–OR deconstructing a piece of fruit or food item. On-going Integrated Learning Specialist Program: provides K-12 teachers and teaching artists research-based frameworks and practice-proven strategies for supporting culturally-responsive arts-integrated teaching across the curriculum. 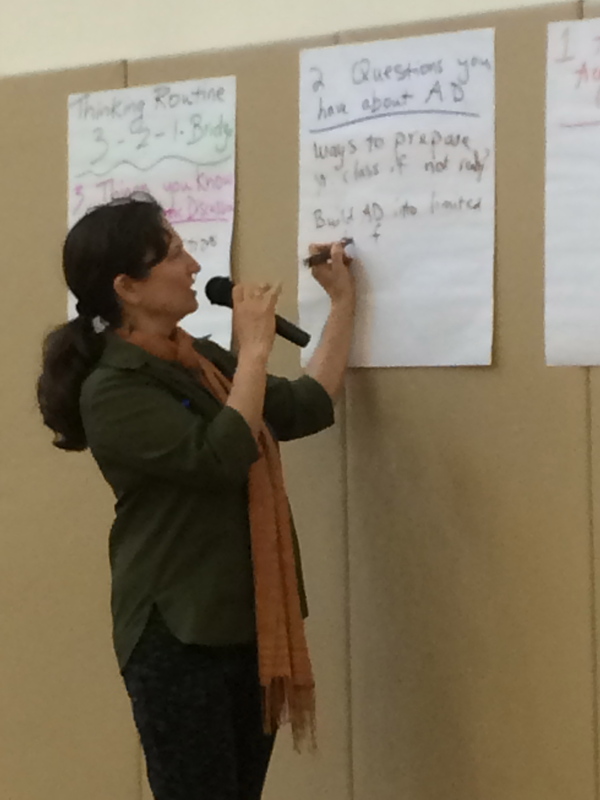 Next Meeting – Wed, May 11 – Will meet with the larger OUSD visual and performing arts teacher group – Location TBD. We will celebrate this year and plan for next year. Participants: Deborah Green/Oakland Tech; Deborah Gordon/Castlemont; Ericka Duke/North Oakland Middle School; James Treacy/Skyline; Lauren Litwin/Skyline, Karen Zinkalfsky/Oakland High, Claudia Goodman-Hough/Redwood Heights, Ernest Alatorre/Greenleaf; Carissa Moline/New Highland Academy; Steve Bronson/Oakland High; Donald Greene/Melrose Academy; Michelle Lewis/Glenview; Carla Oden/Skyline, David Mertern/Oakland High; Blanka Soltys/Studio One; Ann Wettrich – OUSD/VAPA facilitator. Inventing Our Future / Integrated Learning Summer Institute Aug 9-11(Tue-Thu) from 8:30am – 4:00 pm at Chabot Space & Science Center; Theme – Re-Storying Our Common Humanity – Changing the Dominant Story is Liberation; Creating Shared Story is Transformative; Creating Action around Shared Story is Revolutionary. Join us for this 3-day journey where we use storytelling as a tool to move us from empathy to solidarity, recognizing one another as parts of a growing community of allies and assets. Visit the website www.inventingourfuture.org for more information and to register. The OUSD Visual and Performing Arts Dept. is pleased to announce the 2016-17 Arts Incentive Grant Opportunity. Funds are available to build or expand arts learning opportunities at OUSD schools. Information and Applications may be found at this link:Arts Incentive Grantshttp://www.ousd.org/Page/12732 Who can apply: Individual OUSD School Sites, networks of Schools in conjunction with a community-based organization, or divisions within OUSD in collaboration with school sites; Application Technical Support Workshop dates are April 6th, 7th, 12th and April 18th from 4:00-6:00 PM at International Community School Music Room. Attendance at one workshop meeting is recommended for all applicants. Please register for Application Workshops through On-Track Technical Support Meetings(On-Track login required). Applications are due emailed to vapa@ousd.k12.ca.us by May 16th, 2016. Michelle announced an upcoming opportunity at the DeYoung Museum – The Association for Latin American Art Conference “Art at Large: Public and Monumental Arts in the Americas” March 19th & 20th. 2. The Role of Technology in the 21st Century. David engaged us in this hands-on workshop presentation. He began talking about his love of hands-on making, engaging many media and material, but he is also interested in introducing students to technology and challenged the stereotype of youth as advanced computer / digital technology users. While many are social media / Facebook savvy, he makes the case that students need help in engaging with educational resources and tools online. He began with the website he created for his teaching, using Site Builder at $75/annually that he recommends for its ease of use. His multidimensional website includes student assignments, lesson plans, student work, digital bios, arts resources and much more. The site is a great teaching tool and enables students who miss a class to easily catch up on what they missed and can encourage them to write and publish their work. 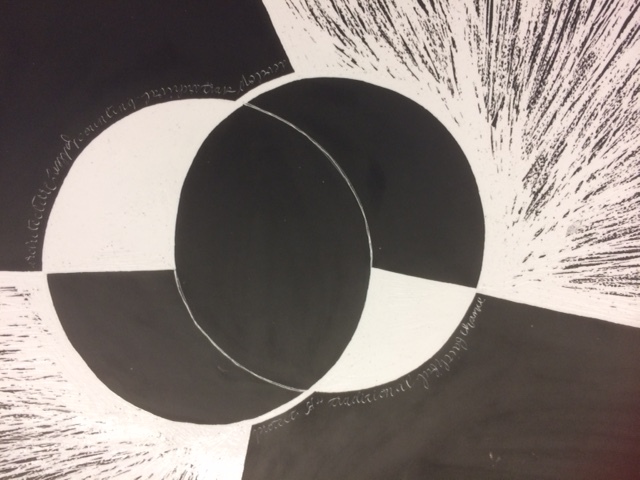 Michelle challenged writing in the art classroom—given the limited amount of time available for engaging in making and studying visual forms. Ann suggested a resource book for those who are interested in getting visual arts students engaged with writing about their work: Mapping the Intelligence of Artistic Work By Anne West (critic, curator, educator & writer). 3. Teacher Exchange – We went around the circle and everyone had an opportunity to check in and share projects and ideas. Deborah (Green) – presented a few ideas from her Art 1 class, where she has 150 students with a wide range of attention spans – from zero to total focus. Academic discussion: She’s been experimenting with this by using a simple questions prompt: How was your weekend? What is something you did that you felt good about? Studying master artists: Students research an artist of interest online and create a poster to present this artist to their classmates. Students learm research, presentation and graphic design skills, as well as gaining a deeper understanding of an artist and their work. She requires students to include: name of the artist, an image and description of of their work, and a quote. They must also write a reflection on the back of their poster—describing what they like about this artist and their work AND what they learned. Sketchbook Journal: Deborah has created a templated worksheet called “Oakland Tech Sketchbook” for the 6 week marking period. Students do at minimum of 5 sketches (10 minutes each) following prompts and drawing from observation. There is also space for journal reflections and prompts. Lauren – discussed several projects she is working on with students: portrature/photographs; secrets of commercial food photography; making a chidren’s book with the class that includes writing poems and conducting research into illustration from the midieval to contemporary times. Claudia – she is collaborating with a teacher at here school and working with students to create a films in imovie — 6 stories leading up to the American Revolution. Students are making costumes and writing scripts, as well as filming and editing. She will send the group an invitation to the screening. Erika – she is a first year teacher at West Oakland Middle School. She recently graduated from Mills and is currently pursuing a Ph.D. at USF. She is engaging student in a discourse on Oakland artists and having them visit her classroom, i.e. Malik Seneferu and masks from West Africa. Students are interested and engaged—speaking about how they see themselves in the masks. Jamie – Skyline is working on developing a Career/Tech Ed Program. Has completed the first draft of an AP art class that will serve as a capstone course for seniors in the program. Ernie – explained that he has no formal training in art, and has been filling in a gap at Greenleaf working with elementary students. 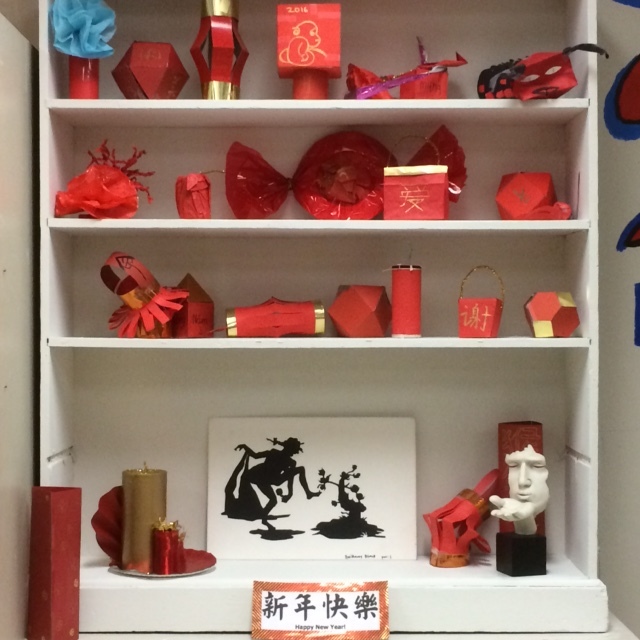 With mixed success and learning along with the students, he has been connecting art projects to holidays and is exploring clay along with the students—using online resources to help guide the process. 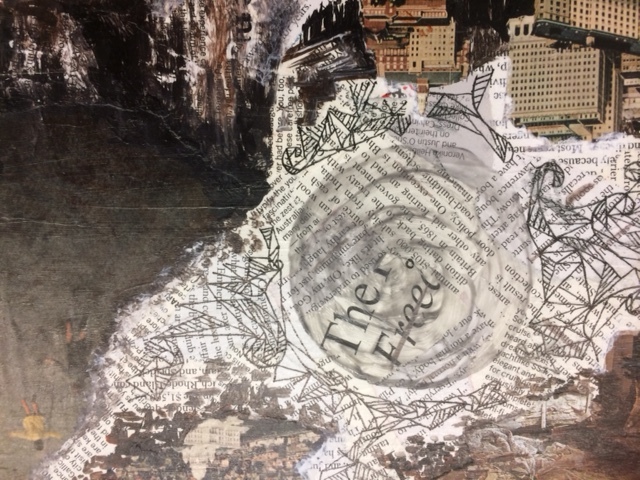 Carissa – she is doing a collage projects with students with the intention of scaffolding their skills and working into a project that involves making their own special place. Donald – he is engaging kids in art projects around popular culture films and themes—Star Wars and Sponge bob Square Pants. They are working on making and scanning ther drawings to create an animation. Quilting. Her classes have been working with the African American Quilters Guild of Oakland. 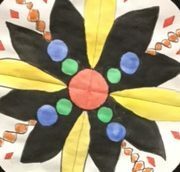 The Guild has spent two days a week in her classroom over a 3-4 week stretch—engaging the students in quilting projects that include learning applique, making patches and paper pinwheels. The Guild has provided this programming, including all the materials at no cost to the school, and is now working on adding batting and backing to the students work. She highly recommends the Guild’s work with schools. Imaginary Animals. 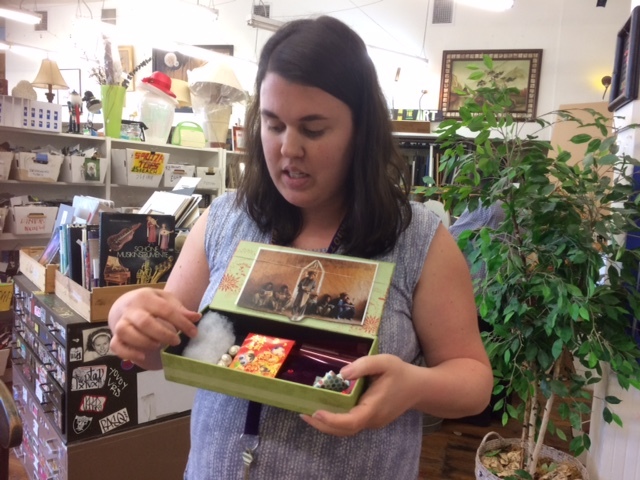 Michelle went to the Richmond Arts Center and took a workshop using recycled materials to create a sculpture of an imaginary animal by morphing two creatures into one. She is planning to adapt this workshop with her classes and thinks it will be a 2-week project. Wed, May 11 – Skyline – Carla offered to host and present a workshop on career / tech ed. TBC. Visual Arts Teachers Network Participants: Deborah Green/Oakland Tech; Michelle Lewis/Glenview Elementary; Carissa Moline/New Highland Elementary; Ernest Alatorre/Greenleaf Elementary; Ana Ponce/Skyline High; David Mertens/Oakland High; Jamie Treacy/Skyline; Karen Zinkofsky/Oakland High; Ann Wettrich/OUSD Visual & Performing Arts consultant. Thanks to OUSD, VAPA staff, Sarah Wilner and Phil Rydeen, for organizing this joint VAPA session on Restorative Justice with David Yusem, OUSD Restorative Justice Program Manager! Intro. David began by setting up a circle of chairs with an installation in the center that included musical instruments, oranges, and other colorful objects gathered from around the room that symbolized intentions for the session. After introducing himself and the restorative justice community circle practice, David explained the role of the talking piece (symbolic object) that is passed around the circle and held by the person speaking, as a way to reinforce active listening. We practiced this as we went around the circle to introduce ourselves—name; role at OUSD, and our favorite music and/or dance when we were in middle or high school. Background. David then provided more background information about restorative justice and outlined its purpose and basic principles. Rooted in ancient practice, restorative justice was reinvented in a modern context in New Zealand. Based on Maori indigenous community practices, it addressed the issue of Maori overrepresentation in the criminal justice system. Family group conferences were organized with offenders, victims and with police officers to hear about the impact of harmful actions on everyone involved. The goal was to stop the cycle of harm, knowing that harmed people harm people. Through this process, they worked on making a plan to remediate harm that is victim oriented and community centered—countering institutionalized criminal justice offender-centric practices and establishing accountability through healing rather than punishment. What are the resulting needs? What is the obligation to make it right? Who needs to come together to restore justice? It is difficult to have this kind of conversation without a sense of community in place that everyone feels connected to. Therefore, the first priority is on community building in an environment that is equitable and promotes learning and social/emotional engagement. David went on to explain their three-tiered program model that includes community building, harm/conflict engagement and individual support. 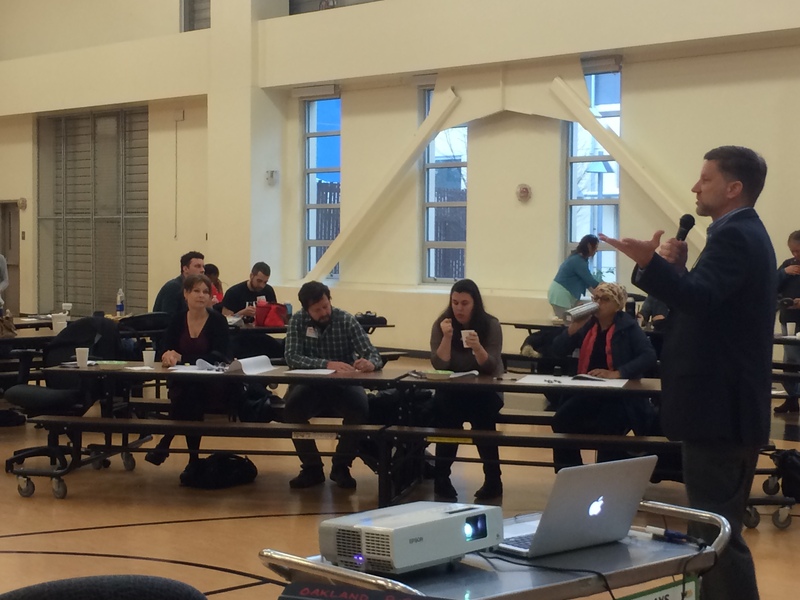 OUSD Context & Resources. In OUSD many students are suffering from trauma and are in the fight/flight/freeze zone, where it takes courage to just show up at school. Learning cannot happen for traumatized students, whose sometimes disruptive, defiant behavior can enact harm on others. How can we use restorative justice to better understand and break this cycle? Restorative Justice Resources and tools can be found at this comprehensive link. 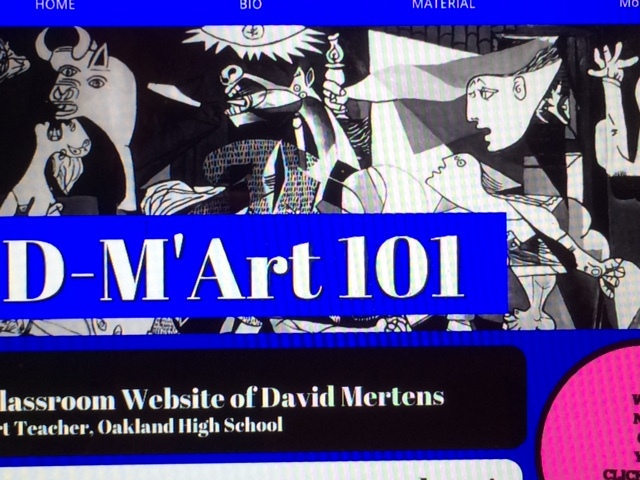 Next Visual Arts Teacher Network Session: March 9th, 2-4 at Oakland High School, hosted by David Merton. 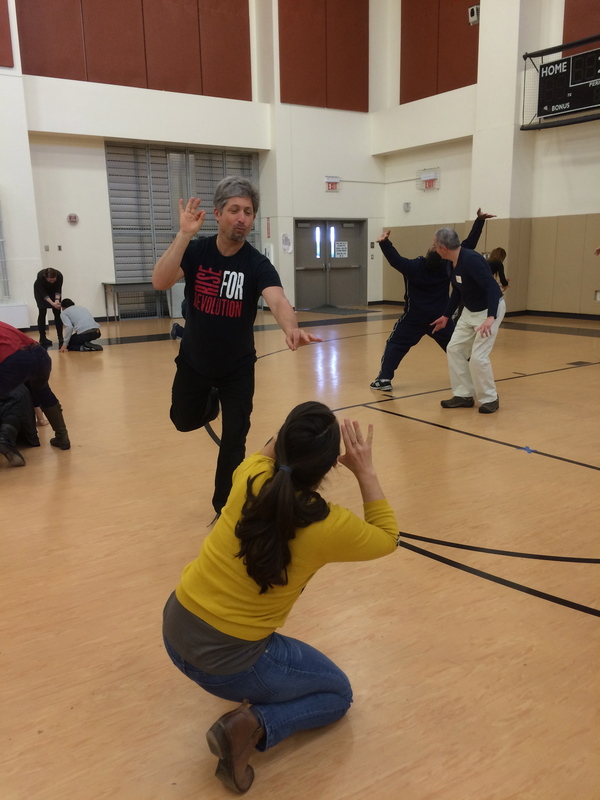 Theatre and movement warm-up exercises led by Awele Makeba, storyteller, teaching artist. Keynote talk by Berkeley based, internationally acclaimed visual artist Mildred Howard. Mildred showed slides of her work and discussed her inspirations that ranged from music, literature and science to addressing social justice issues. Introduction to Academic Discussion with OUSD experts Viet-Ly Nguyen and Michelle Perkins. We practiced two routines (Stronger & Clearer Each Time and Ranking Musical Elements) in small groups, responding to Mildred’s piece Volume I & II: The History of the United States with a Few Missing Parts; and a jazz music piece performed by four musicians–saxaphone, vocalist, keyboard, clarinet. We spent the afternoon at the Oakland Museum, beginning with a welcome and overview of museum resources for educators by Amy Billstrom, Associate Director of the museum’s learning initiatives. 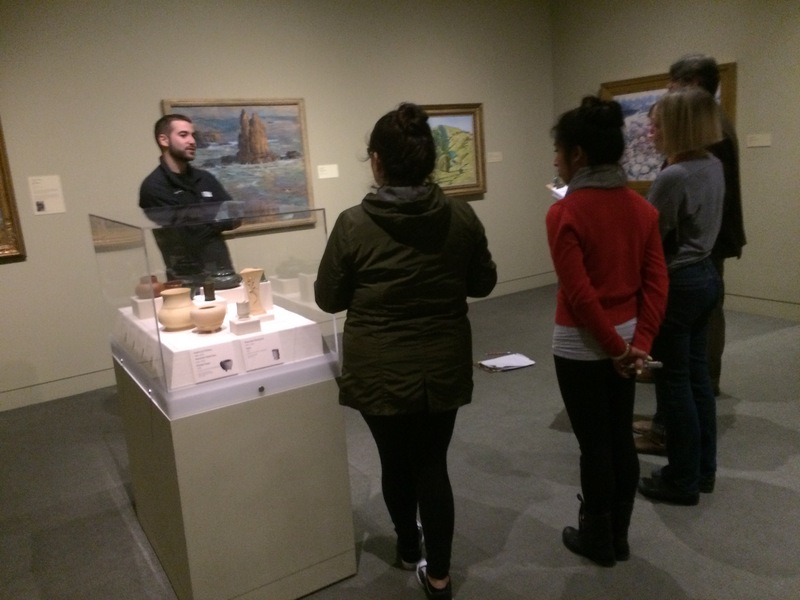 We then broke into small multi-disciplinary groups and explored the museum galleries with docents and practiced teacher-led academic discussions responding to selected works of art and exhibits. In the final half hour, we met in discipline alike groups for reflection on the day’s experience and learnings. 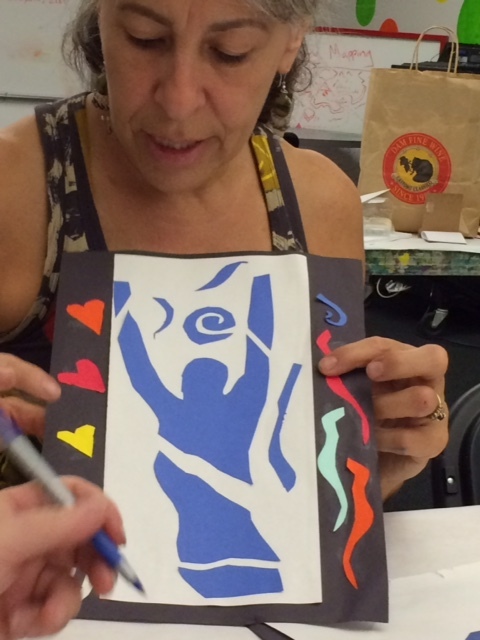 Click here for a summary of the visual arts teacher group’s reflection. ALSO click here for Jan 29 PD day linkable resources from the day, including the powerpoint. 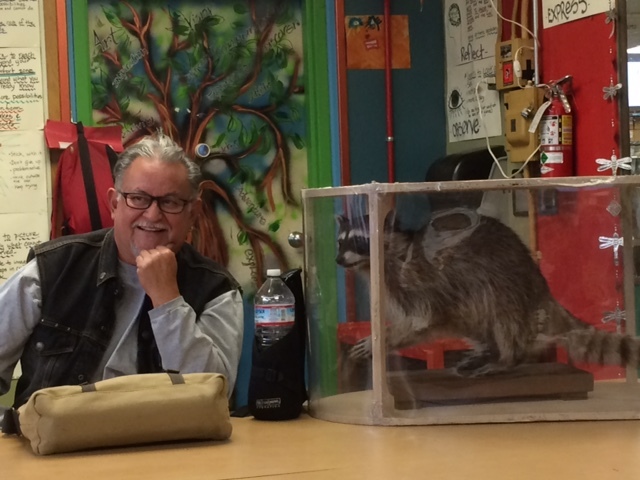 Thanks to Claudia Goodman-Hough for hosting the meeting in her classroom art studio at Redwood Heights! Roxanne announced that this her last meeting to serve as lead for the group due to heavy load of responsibilities as Executive Director at MOCHA. Ann will be taking over this role. Roxanne expressed her enjoyment in working with the group and getting to know everyone. She is proud and happy to know such a passionate, caring and creative group of people dedicated to teaching in Oakland public schools. She offered her support in providing access to the MOCHA site for meetings and exhibitions and may fill in for Ann if the need arises. The group expressed appreciation to Roxanne for her on-going support and leadership. Claudia pointed out that the taxidermy spread around the room is on loan from Lindsey Wildlife Museum in Walnut Creek—a great resource for life drawing. Jim at Fremont is in his first year there is creating a print based curricula and using a $1,000 grant for materials to purchase materials and equipment. Peter at Oakland Tech, who teacher 3 levels of animation, is using Flash and his advance students are learning to navigate multiple canvases. 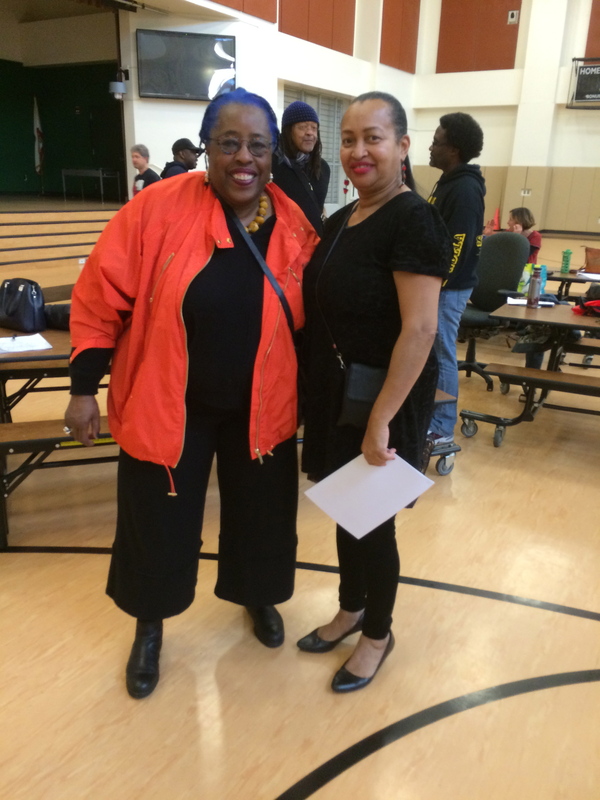 Michelle, art and dance teacher at Glenview will be partnering with the African American Quilters Guild during African American history month in February. Their quilters will be working directly in the classroom with the students. Kevin, art teacher at Dewey is also teaching a Pathway Course in Health and Fitness connected to Peralta College where he integrates the arts. Ernie announced, as prep teacher at Greenleaf for the past three years, he will be leaving this post next year and is seeking a replacement art teacher. January 29th – VAPA PD day 8:30-3:30: focus on the question: How can we use a museum and the arts as a way to promote academic discussion acadeicdiscussion within the contexts of our individual classrooms and subject areas. La Esquelita School / Oakland Musuem. Mildred Howard, Michelle Perkins, Amy Bilstrom; Engage Thinking Routines / Academic Discussion protocols in looking at art and artifacts in the museums three galleries. There will be multidiscpinary exploration groups and disciplinary debrief group at end. Spreadsheet for Equipment Inventory & Exchange on Google Docs for you to add content and items to. Restorative Justice. Responding to interests expressed in learning more about restorative justice community circles, we will have a joint meeting with music teachers in February focused on Restorative Justice with David Yusem who will discuss: what is it, how does it work, where it is being implemented, what can we do in our own work with it. David is reputed to be a great presenter, and it’s a way to learn more about on OUSD’s cutting edge work in this area. Design Thinking / Maker Spaces. 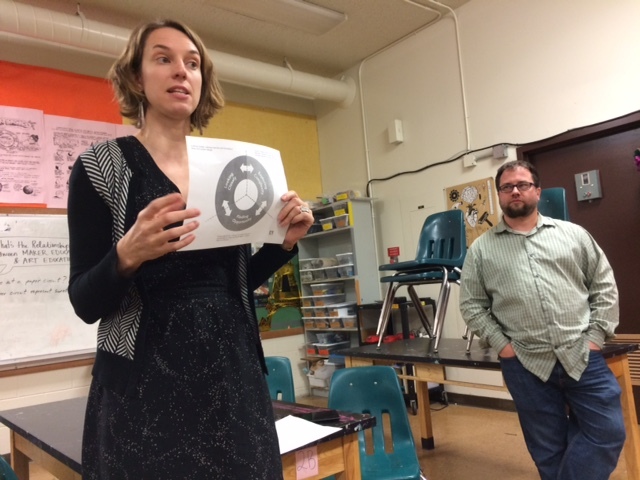 Brooke Toczylowski, former art teacher at Oakland International is now working with OUSD and Agency by Design to advance design thinking and maker spaces in Oakland schools. She has offered to do a workshop at one of our upcoming meetings. The group expressed an interest and Ann will work to schedule her for April or May meeting. Dewey Academy: Kevin engages academic discussion in an easy low stakes social dialogue way at the beginning—to bring student voice into the room and cultivate community. This can be a challenge for new students. He implements a reciprocal teaching strategy—teaching the students tricks for immediate social success. 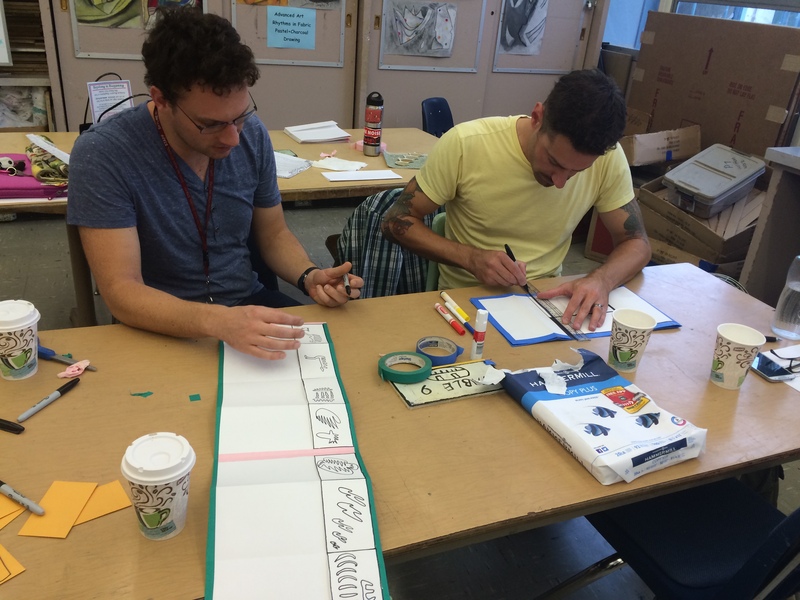 Oakland High: As a former ESL teacher, David used PROPS to weave themes into everything. He brings a commerical art focus and structures his classroom like a business where students hold meetings, create companies and hold titles like VP and Creative Director. They have to come up with marketing sales and marketing campaigns. This propels student research, reading, writing and discussion. Written forms may include writing a slogan or copy for a web or print ad. They also use technology as a medium for communication and blog discussions. Redwood Heights: Claudia has students, first thing, come and sit in a circle where they do turn and talk. During class she often asks them What do you notice or think about this or that? She uses Studio Habits and Gallery Walks to promote focused dialogue about what they learned; or what was easy or challenging. She also posts do nows at the start of every class, often having students create goals. At the end of class they write about what they learned and liked best. Castlemont High: Academic Discussion is school-wide with protocols like: challenge, agree, disagree cards that support different points of view. Deborah also uses Agency by Design thinking routines to promote discussion. Students often lack confidence and she uses sentence stems to scaffold their participation and help to frame and articulate their ideas. New Highland: K-5 supports academic discussion. Carissa engages pair/share reflection at the end of the class period and uses sentence frames. She has created arrows on the tables so that students know who their pair/share partner is. They practice this routine regularly. Students love it. 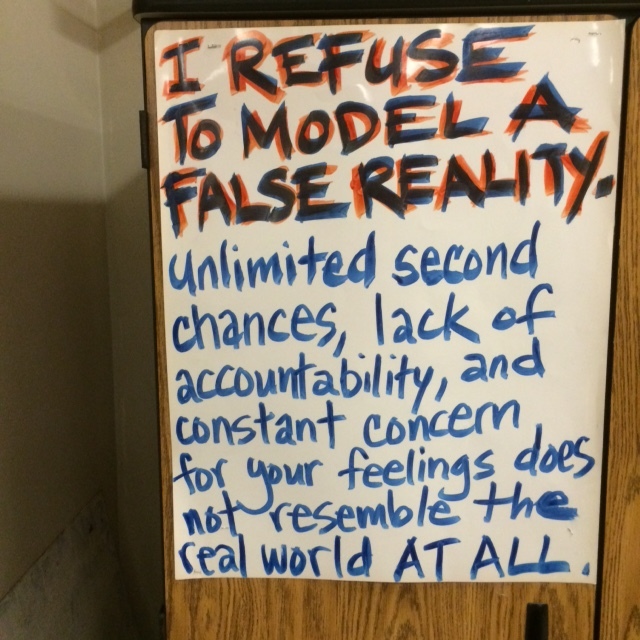 The challenge is establishing trust and holding students accountable for listening. Older students are more reluctant. She often used prompt question like: What is a choice made in your work today that made it different or personally meaningful? 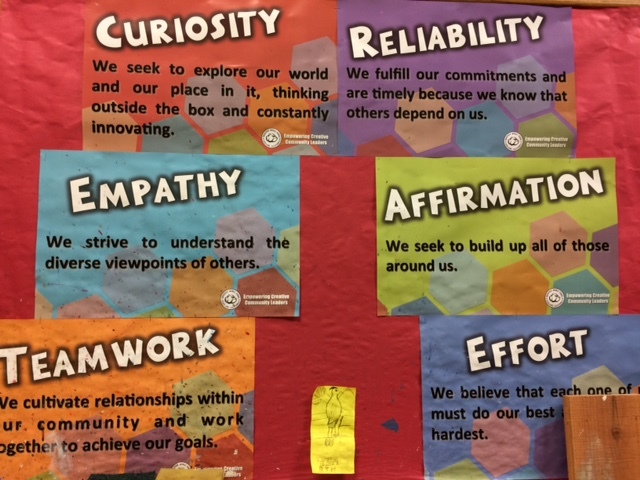 A good grade specific source to help create inquiry prompts within the core competency areas of Create/Perform/Connect Respond can be found on the National Standards website under visual arts. Bunch Academy: Academic discussion is strong and pushed by the school. Training for the entire staff is provided—meeting daily. Nestor uses critiques and gallery walks to promote discussion. 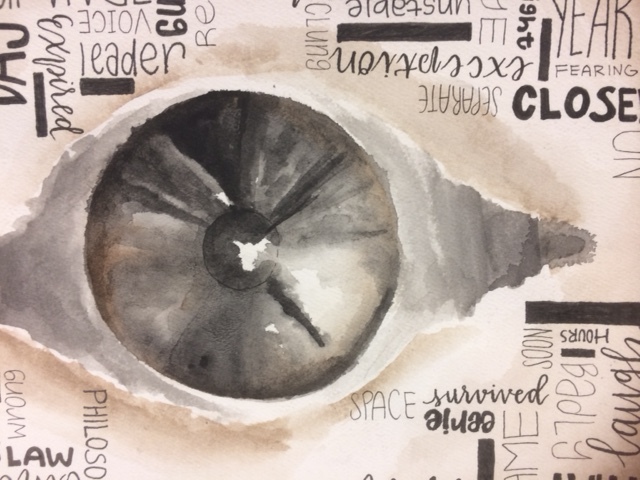 He gives prompts using arts vocabulary and academic language and has students break into small discussion groups before coming back into whole group dialogue where they respond to the question: What did you discover? For final preparation he uses academic discussion to help them develop five paragraph essays. This involves going into a new space (they use the restorative justice room) and includes doing preparatory quick sketches and practice using art vocabulary and academic language to communicate, intellectualize their ideas and speak out loud. 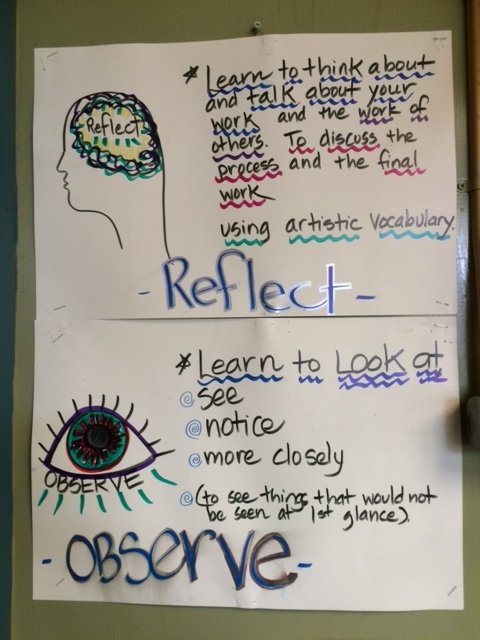 Glenview Elementary: As the time in an art class for academic language is very short, Michelle uses VTS and Gallery Walks as a way to engage deeper looking, reflection and academic discussion. 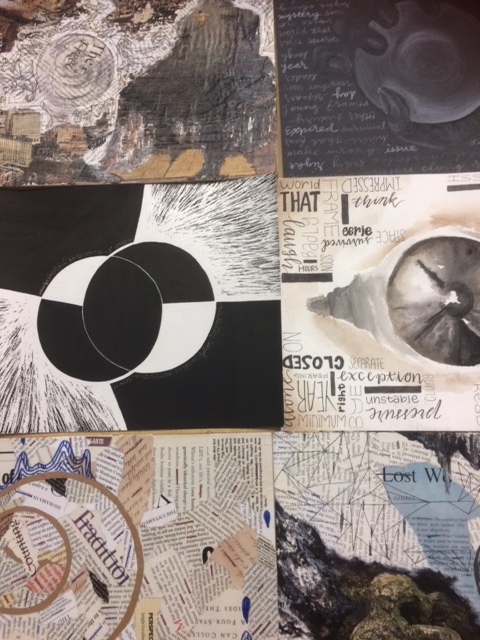 Skyline High: Many of the students are behind and struggling, so Ana uses Studio Habits and mapping strategies to help them articulate and communicate their thoughts. Oakland Tech: Employing silent literacy strategies Deborah has her students do written reflections on every piece and also does Gallery Walks where students use post-it notes to comments. She subscribes to Scholastic Art Magazine and selects articles for students to read and complete worksheets. She is inspired to add the turn and talk routine to provide an opportunity for peer-to-peer academic discourse. Peter attended PD for academic discussion that was centered on English and History. He is struggling with this protocol and relation to art that he believes comes from the heart and not the head. He does a little academic discussion by having students view and talk about short films and through the process of critiques, gallery walks and reworking and refining drafts. He likes the idea of pair/share where everyone gets to talk. 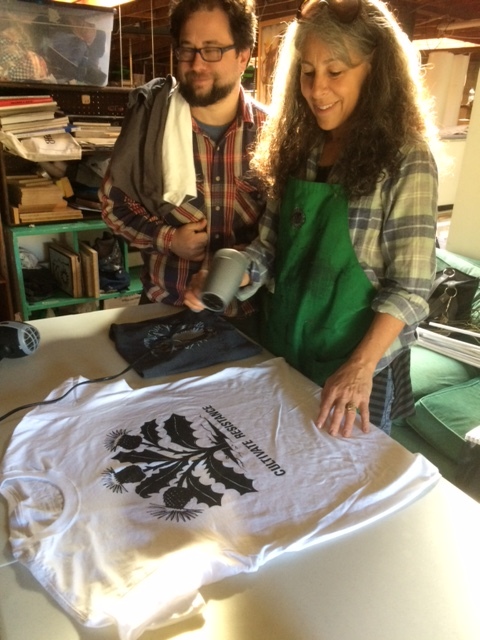 Maker Fellows Program – Claudia and Deborah participated. Debora wrote an article for the Oakland Tribune soon to be published on this program. They learned how to create classroom maker spaces. This is a new well-funded professional development wave. It comes out of STEAM and Agency by Design. Deborah is interested in using design-thinking strategies school-wide in considering the question: How can we make Castlemont a safe school? Claudia talked about how it provides another lens for learning that engages tinkering, and playing, and making a wide range of things (i.e. a meal, a garden, a boat). Teaching & Learning Strategies – David shared: 1) Smart Phones: Students love to use smart phones and David decided to use their interest to focus their learning. He created an engaging classroom website they can access on their phone. The site provides instructions and resources to scaffold, motivate, propel and reinforce learning. 2) Grading: David came up with a new assessment—giving students a grade at the every class to keep them focused. Friday, January 29th 8:30-3:30 – La Escuelita School, 1050 Second Avenue and the Oakland Museum, 1000 Oak Street at 10th. Lunch from 11:30-12:30 on your own. The Oakland Museum has a wonderful cafe or you can bring your own lunch. Wednesday, February 10th 2:30 – 3:40 at International Community School/Teach College Now, 2825 International Boulevard. 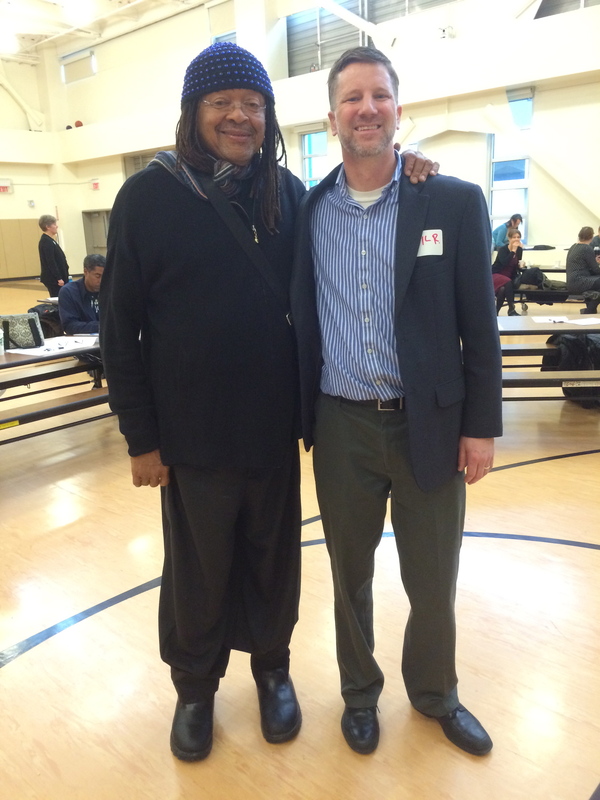 This joint workshop with music teachers on Restorative Justice. David Yusem will come talk to us about Restorative Justice in the district: what is it, how does it work, where it is being implemented, what can we do in our own work with it. David is reputed to be a great presenter, and it’s a way to get caught up on OUSD’s cutting edge work. Jamie is currently working on developing and writing the curriculum for an AP art class at Skyline. Alicia mentioned that a SF Art Institute representative had recently come to her class to talk to students about the school and its application process. This year, they tried a new structure that worked well and she recommends–the rep stayed and talked to each of her classes and even took the time to stay to talk with interested students and review their portfolios. Ana is planning a portable mural that Monroe students will be working on for the fence of nearby Sobrante Park. Friday, January 29th full day OUSD PD “buy back” day. We will be at La Escuelita school in the morning and the Oakland Museum in the afternoon for all arts teachers and any other teachers from the district that are interested. Plans are still being formulated and include: 1) Visual Artist keynote talk about their work. We’re planning planning to have a local, internationally known artist Mildred Howard discuss her work and inspirations ideally with cross-disciplinary influences in music, science, literature and/or social studies; 2) Academic Discussion speaker from OUSD—sharing principles and strategies; 3) Exploring observation/reflection protocols and experiment with using them to engage academic discussions; 4) Investigating and learning about how the museum can be used as a resource for teaching and learning across subject areas. Discovering what the Oakland Museum has to offer and exploring their CA art, science and history galleries. Phil asked for feedback and ideas from the group. All liked the idea for the artist speaker and brainstormed alternatives if Mildred isn’t available, Favianna Rodriguez, Hung Liu, Amana Harris, Squeak Carnwath. The group liked the general ideas for the day and mentioned a few things they were interested in learning more about in PD sessions, including Jig Saw protocol maker spaces, and video/animation. Visual Arts Materials & Supplies. An OUSD donor is contributing $50,000. Once the money is received Phil will reach out to visual arts teachers for advice on prioritize what is most needed and figure out how to purchase and disseminate. 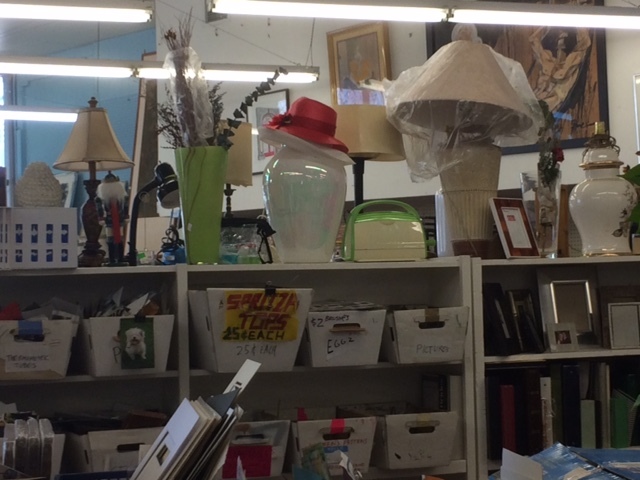 OUSD’s Warehouse has some odds and ends materials that are up for grabs. Contact Phil for an appointment to rummage through it and take what is useful. There are some display boards and the science dept has lots of interesting things for creative reuse. We discussed more expensive needs for equipment, like kilns. This led to a brainstorm on how to find out about unused equipment and/or materials. Phil will make a google doc for everyone to access and add to–tracking equipment and materials up for grabs, as well as needs. Arts Incentive Grants – Phil will let everyone know when the info and technical support sessions are being held next spring for the next round of grant applications. OUSD News Feature Stories – Send Phil inspiring student stories—a photo with a couple of paragraphs—to post in the OUSD e-newsletter. 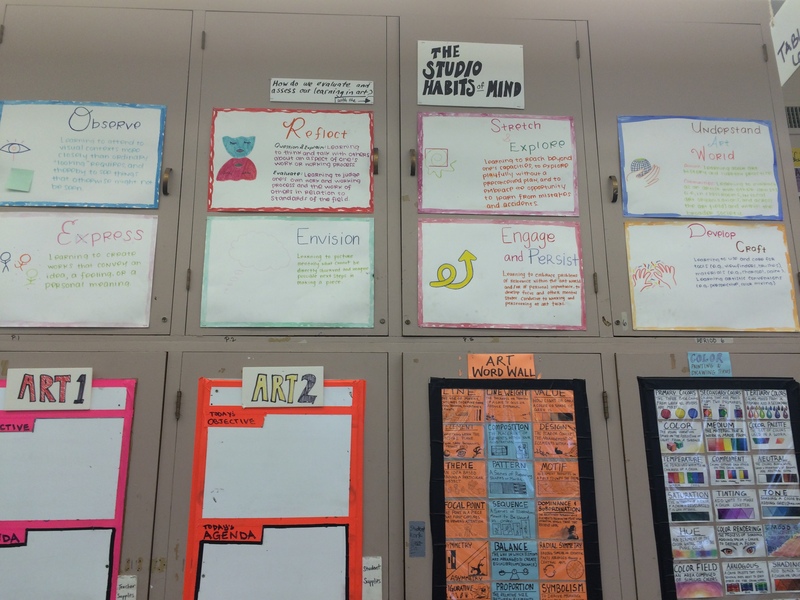 OUSD Administration Hallways – great places to showcase student work. Let Phil know if you would like to do this. Teaching Opportunities – To find out about openings, check the OUSD website. Ideas Brewing – Phil is interested in creating virtual career pathways into visual and performing arts for high school students who might want to become teachers. Perspective Drawing Project – Jaime talked about this three-week project that he did with his Art 1 students and passed out samples of their impressive work. He explained the assignment and his objectives. Students were asked to create their own city (with dream features) and show it from a bird’s eye (one point) perspective, using art strategies learned about earlier (i.e. color, value, shape) to make a finished work. He was very pleased with results and increased student confidence and sense of agency. He wanted them to understand there is a system and methods for drawing—it is not a mystery. For students who were struggling to understand the technique he repeated demonstrations in small groups and encouraged revisions and corrections. He shifted his normal policy by allowing students to turn in the assignment a few days late if they wanted to spend time refining. – sitting and watching how they are doing something, noting what goes wrong and then demonstrating how to do it, trying it together with them, and then asking them to try it independently. – Eldica added that she emphasizes repetition and cooperative learning—where students help to teach each other. Glazed Cups Project – Renita briefly discussed this project she has been working on with students and showed a sample of student work. 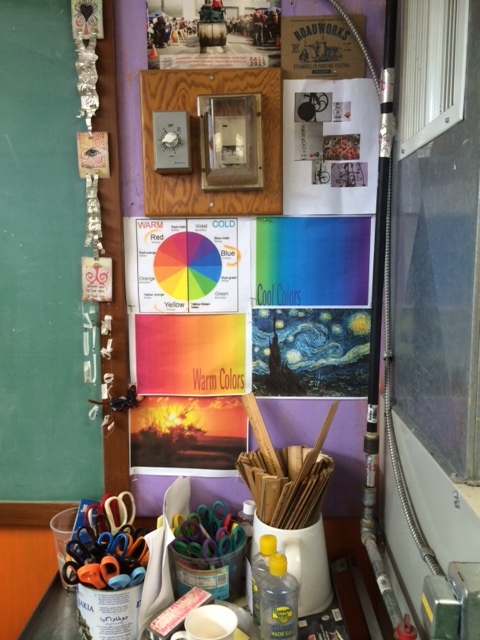 Color Mixing – Deborah talked about her goal of getting students to slow down and experiment. She shared her rubric, resource materials and strategies that have worked for engaging and focusing the students, including DeYoung Museum workbook pullouts, and the see-think-wonder worksheets created by Eldica Miller . She also uses links to royalty free images that she found posted on Alicia’s website. The color mixing project involved using Crayola pencils and mixing color on the paper by adding multiple layers and experimenting rubbing in solvents (cooking oil, rubbing alcohol or Ecohouse cleaner) with q-tips or beat up bristle brushes. Students are excited to “see the magic” as their work transforms. Making Place: The Architecture of David Adjaye at the Art Institute of Chicago (Jamie) – He made a power point after seeing this exhibit for his students, including his sketch books and online videos. He also was inspired by Akjaye’s seven volume book African Metropolitan Architecture with his documentary photographs. Wednesday, January 13, 2:00-3:30. Redwood Heights School in Oakland. Jamie teaches Art 1, Art 2 and Advanced art at Skyline where he’s worked for 4 years, though he’s been teaching within the district for 11 years. Carla teaches computer tech and art/graphic design classes at Skyline for about 10 years. She has a background in medial graphics and worked at Stanford where she did both anatomical and conceptual drawings. She also worked for the city of SF as a form designer for their Regional Occupational Program. These experiences, along with her teaching work at Arts Far West many years ago, prepared her well for her work at Skyline. Lauren has been at Skyline for three years. She teaches digital photography and illustration. 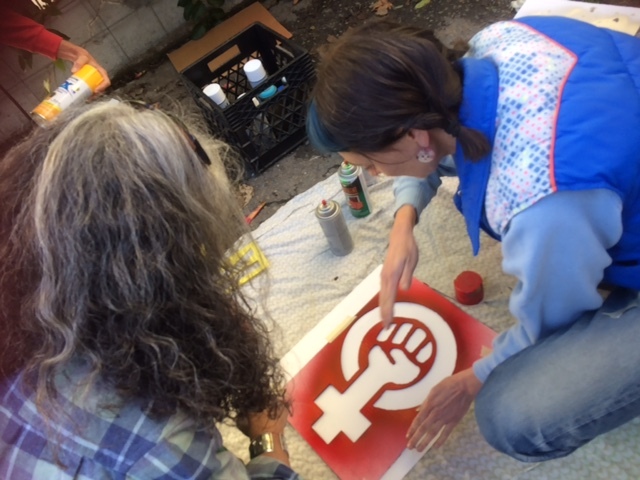 She reported on recent activities–attending California Alliance for Arts Education; and working with students to make posters for the PBIS/restorative justice program. Ana is in her first year at Madison (Madison Park Business & Art Academy), where she is a “founding” art teacher and has an opportunity to shape the program. This year she is setting up foundational art classes as she settles in and builds relationships with students and families. She teaches five classes a day (9th and 11th grade with one mixed grade class). Next year she hopes to work more collaboratively with other Madison teachers. Previously she taught at Castlemont High for two years and spent some time in Santa Barbara focusing on her own art practice. Kristin teaches at Grass Valley Elementary School where she works with students in all grades. She is currently working with upper grade students on a theme related collage project and is introducing the work of Romare Bearden. She asked the group for ideas to inform this project. Many chimed in with ideas that included: bringing in texture, using photos and rearranging skin tone with fabric or oil pastel and using collage as lead in to abstract drawings; introducing children’s book illustrators Eric Caryle and Jack Ezra Keats to show painted paper collage strategies. Also self portrait collages and Ntozake Shange’s poem and Bearden’s illustrations in the book I Live in Music. Alicia at FADA is wrapping up a unit and exploring a new critique structure that begins with viewing student art work in a gallery walk style and having students give feedback by leaving positive and/or stand out feedback next to the artwork using post it notes. Each student is required to leave 5 comments. The next step is for the artists to read through the comments. Each artist then shares out meaningful and useful feedback. This structure worked well as less formal alternative to what she has used with the group previously–Feldman’s Model of Art Criticism with the students (description, analysis, interpretation and judgment). She is wondering how to better capture and make visible what the students are learning and saying. Deborah at Oakland Tech is working with students on a project she referred to as “language of art books” embodying the elements and principals and brought some examples to show. She is drawing on resources from Alicia’s website—using line to represent “line,” shape to represent “shape,” and form to represent “form” that inspired adding a pop-up book approach and led to interesting student questions and about the differences in 2-D and 3-D and the 4th dimensions of time, as well a wondering about other dimensions and space, energy (color/light). Deborah expressed the challenge of working with students at different levels of understanding and experience from neurologically damaged to advanced, in the same class. She has started using coloring book formats to teach color exploration and theory and has found this works well and is relaxing and stress-relieving for all students. – Community Circles (a multi-tiered structure for cultivating academic and citizenship welfare). Jamie uses this with the goal of getting to know each other and deepening understanding of the why and interpretation of individual/school/classroom/community values. He does this a few times each semester. 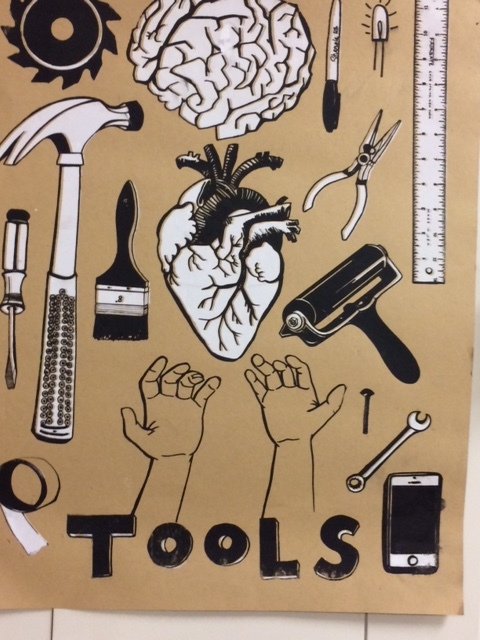 – Restorative Justice Strategies– Lauren discussed getting students to think about the repercussions of their actions in stealing and/or disrespecting and damaging tools and materials. She often reiterates the appropriate use of materials and has effectively used detention as a deterrent if needed. Detention students have to clean up the room after school. She also reminds them that the next step after detention is referral. An idea emerged to explore the possibility of having a restorative justice/community circle expert come to one of our sessions. Jamie presented three projects quickly and showed examples of student work. – Mask Project – He began the project with a discussion of purposes and traditions of masks across cultures and times. Students were required to do computer research to make masks that represent a mixture of patterns from two different cultures (could also include a popular culture pattern). There was an emphasis on and requirement to use patterns and texture. – Sound Box Project – This project involves conceptual thinking, drawing and design. Students do visual research and brainstorm lists of kinds of sounds, i.e., traffic sounds, basketball sounds, rain, etc. They then select a sound that want to represent and make thumb nail sketches. They decide on their approach and draw on a template pattern for a prism or hexagonal shape as their ultimate box form. Students then have to figure out how to scale up the template for the paper size—there are mathematical calculations they have to grapple with to do this. Students then make the folds to create their sound box. – Symbol / Metaphor Color Pastel Project – inspired by Georgia O’Keefe’s work. They start with outdoor research, gathering objects and ideas from nature to explore symbol, metaphor and abstract representation. Superhero Project. Carla presented and showed samples of student work from her graphic design class. The project was inspired and informed ACME Communications student conduct curricula and by the Center for Attitudinal Healing / Art Esteem’s super hero project work that empowers students through the arts and promotes non-violence through the principles of attitudinal healing. 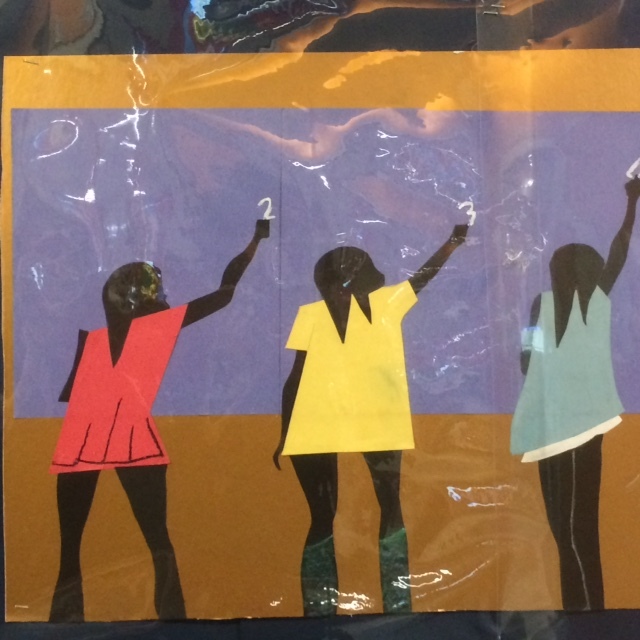 The goal is to advance the idea of “self as superhero.” She begins the project by having students work on paper with gesture drawings and then, after developed their technique, students begin to draw on the computer. Carla also uses films like The Incredibles (especially because it was made by Pixar and sited in Oakland) and has students examine the architecture and identify powers as well as non-violent themes. Based on this research, they then think about what their own powers are. The final step is making a self as superhero poster on the computer. Next Session: Wednesday, December 9th from 2-4. Deborah Green volunteered to host at Oakland Tech. Lauren shared a lesson plan, strategies, student work and artist statements for a lesson plan she developed on comic strip making that engaged illustration and social/emotional learning concepts exploring love, friendship and/or obsession. Her goals were to advance communication skills and tap into students prior knowledge–taking students through explorations of history and a diversity of cultural contexts to expand their understanding. She discussed useful frameworks and protocols she used—See/Think/Wonder routine and PUB How to Critique video. Michelle shared several hands-on art lessons and samples of student work–engaging themes of color, observational drawing (tools) and movement, focusing attention on the elements and principles of art and design. She includes art historical examples as part of lesson—for example, the work of Jim Dine and Matisse. Jamie – Community Circle. He described a successful story telling class he’d just done aimed at helping him to get to know the students better and to build community among class members. The activity was inspired by Chimamanda Ngozi Adichie’s Ted Talk—The Danger of a Single Story. To get the storytelling process started, he shared his own story as an example. Jim – Just started teaching this week and was coming to terms with students lack of confidence with drawing. Deborah Gordon suggested using Elmo Document Camera as a way to demonstrate drawing techniques to the entire class. Ernie is challenged to present visual art lessons connected to curricular goals as his credential training is not in the arts. He described a successful experience involving map making. The group rallied to offer ideas. Roxanne will provide him with MOCHA art for educators resources. Nestor told several stories about engaging teacher professional development workshops he recently lead to enliven faculty meetings at his school site where they have been discussing school year vision, culture, climate, rules and regulations. This involved rolling out large white paper onto tables and having participants create images to represent their thinking, rather than words, and then they collaborated on making up and performing short skits relevant to the topics at hand. See photos below. Thanks all for a generative kick-off to the Visual Arts Teacher Network this year. Thanks to Alicia Arnold for hosting the first meeting at Oakland Tech’s upper campus. 1. Welcome and Introductions. Roxanne opened the meeting, welcomed everyone. 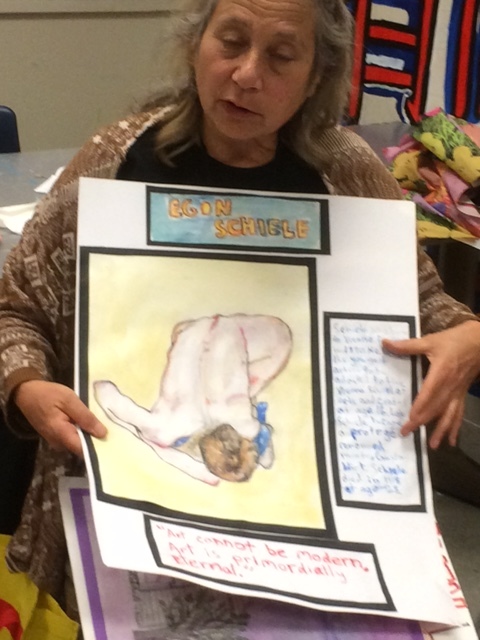 She and Ann Wettrich are working together through the OUSD Visual and Performing Arts Office to convene regular Visual Arts Teacher Network’s collegial professional development sessions this year. 2nd Wednesday of every month from 2:00-4:00 Drop in whenever you can during this time period. We hope to hold meetings at different schools in participating teacher classrooms. We passed around a sign-up sheet for those willing to host meetings. The PD calendar will be updated and posted on the Visual Arts Teacher Network. 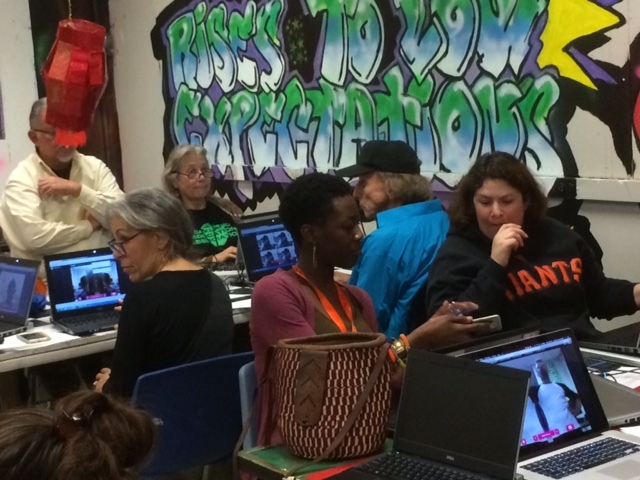 OUSD visual arts teachers can register, using their password, through the On-Track system. 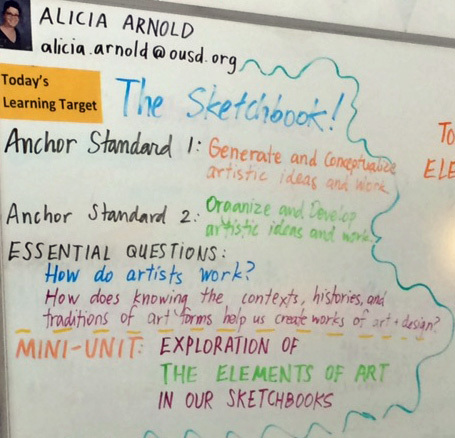 Teaching artists who work in OUSD schools are also welcome, but do not need to register. Calendar – with all our PD dates and locations. 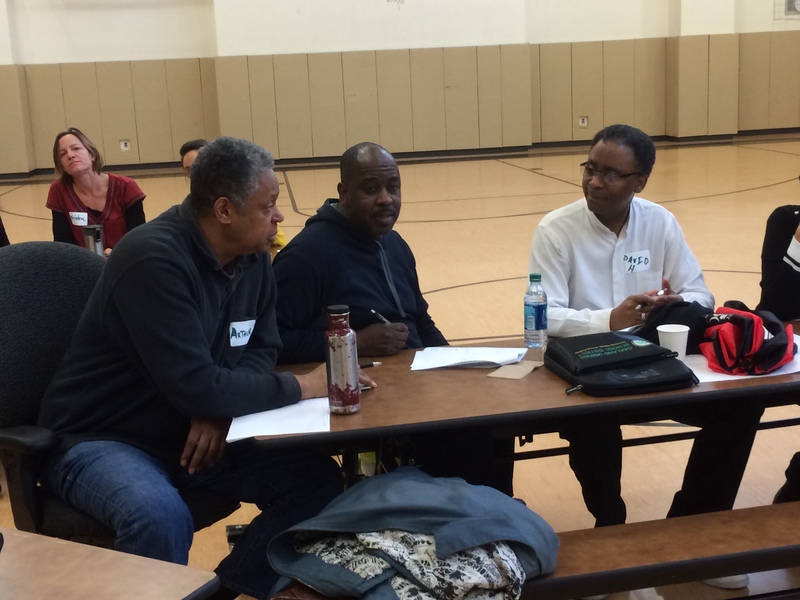 Professional Development Session – this page includes abbreviated meeting notes and photos. Blog – this page is for you to communication with your colleagues within the network. You can enter a question or comment in the LEAVE A REPLY box near the bottom of the page. The first time you do this, it will prompt you to add you name and email info. Then your message will be sent to Ann (administrator of the site) for approval. So there will be a slight delay before you can see your message posted. Arts Blueprint – in 2014 the VAPA office created this new action plan and mission aligned to current district needs and priorities. This covers everything from funding and professional development to communication approaches. Arts Incentive Grants – a new granting program launched in Spring 2015. Grant awards are currently being announced. The next grant cycle will begin in Spring 2016. There are plans to include teacher grant opportunities but the launch date is uncertain at present. Arts Learning Anchor School Initiative – this program is being slowly phased out, but is still active. Information summarizing accomplishment over the last 10 years is included. Dance, Drama, Music and Visual Arts. The visual arts link goes to the Art Teacher Network website. Summer Arts Institute link – this program has been offered for many years, but may be phased out this year. Resources – links to professional arts associations, funding resources, etc. Mostly music-focused. For more visual arts resources, to the resource page of the Visual Arts Teacher Network website. 5. Future Planning. 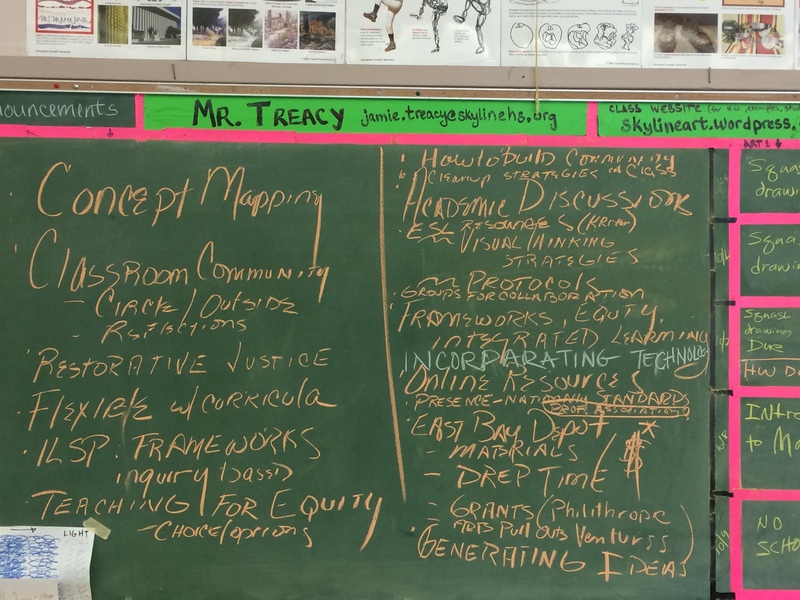 We reviewed our planning notes from October 2014 (copied below) and added a few things to consider this year: Exhibition of Art Teacher’s work at MOCHA that addresses connections between art and teaching (and learning) practices; Session at the Oakland Museum, exploring museums as a site for learning. We then broke up into smaller groups to discuss our interests for the year and begin to make a plan. Upcoming sessions: Wednesday, October 14, at MOCHA (2-4); Friday, October 16, 9:00-3:00 at Oakland Tech in Deborah Green’s classroom. Be sure to register through the On-Lock system. Hope to see you there!! Encourage other OUSD art teacher to attend. Jaime and Peter volunteered to offer workshops in media and painting/watercolor landscapes. We will meet at Oakland Tech and some of our time will be spent at a nearby park. 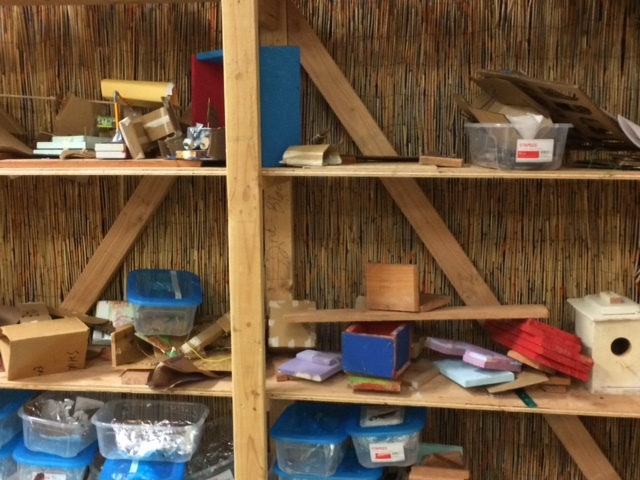 Choice Based Curricula / Makers Space at Maya Lin Elementary School – Roxanne will explore the possibility of scheduling one of our PD sessions at this school, hosted by MOCHA teaching artist Constance Moore. Website Updates. Ann will update with today’s meeting notes and will add resource page updates. Check it out! Send resource links to Ann for posting on the website! https://sites.google.com/site/nglcinoakland/updates/weveannouncedour10nglcplanninggrantwinners 10 OUSD schools received planning grants. Visual Arts Information Summary – Ann will send out email request for a brief paragraph on the visual arts programs at your school. This info will be compiled into a facts sheet on OUSD visual arts and posted on the OUSD Visual and Performing Arts website. How can mapping be useful to your teaching/learning context?